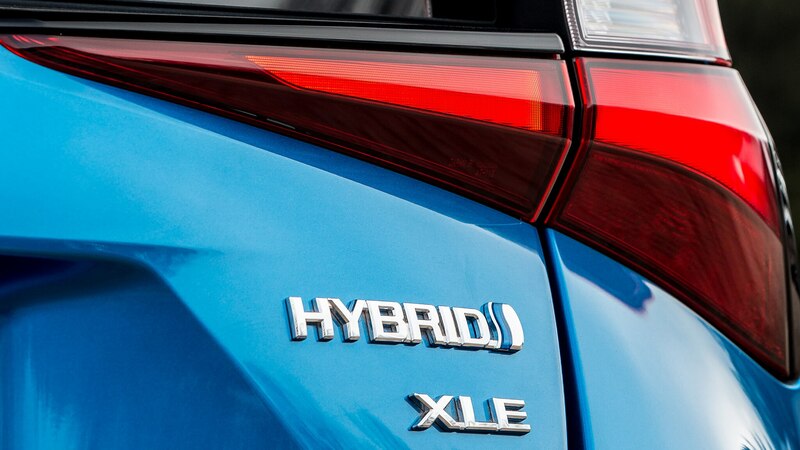 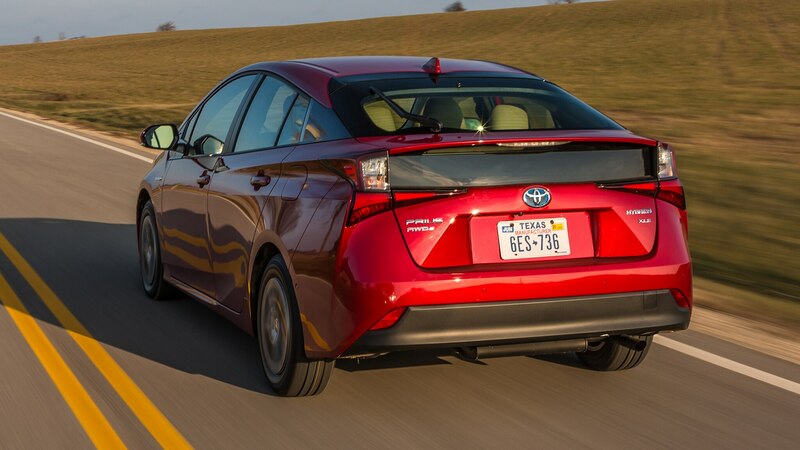 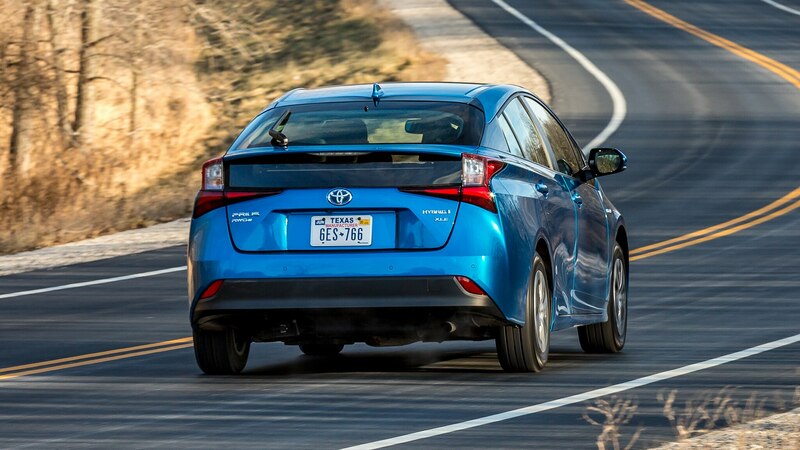 Toyota’s premier hybrid gets a rear electric motor and an even broader audience. 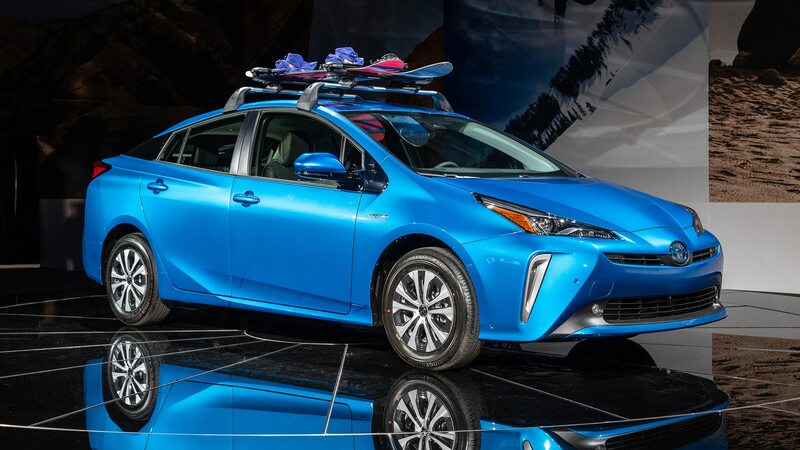 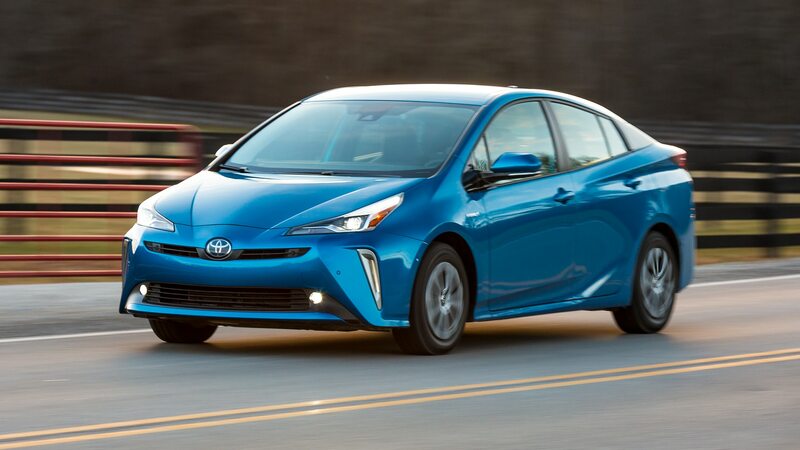 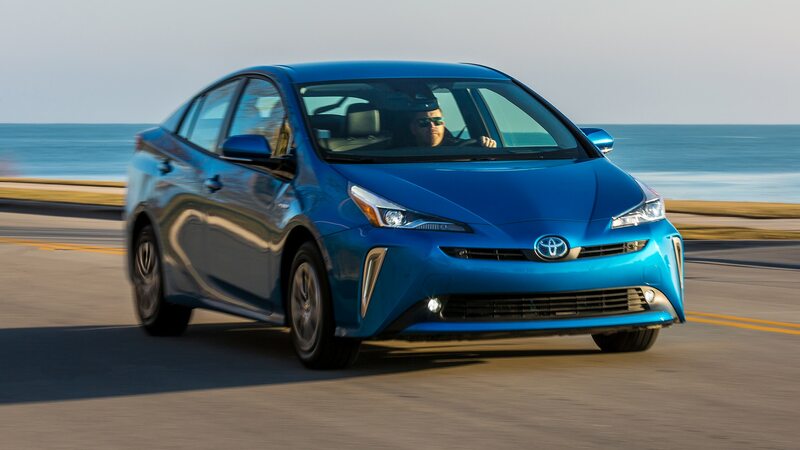 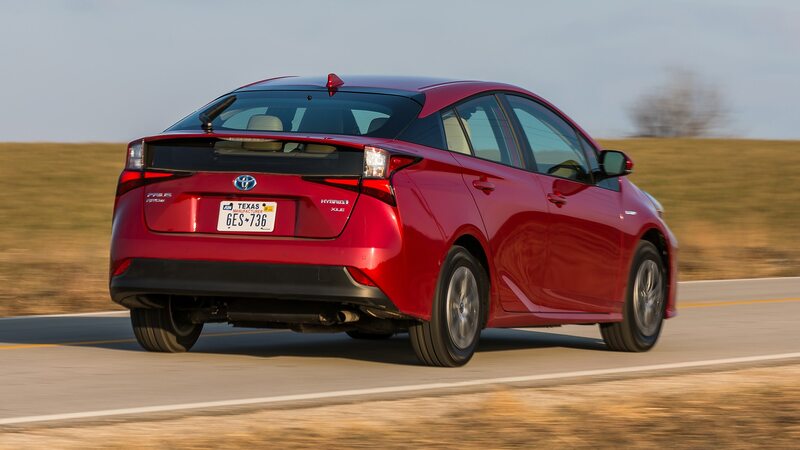 KOHLER, Wisconsin — The Toyota Prius is popular across America as a go-to for drivers looking for a fuel-sipping commuter car, but fervor for the car is perhaps highest of all in sunny locales like our home base of Los Angeles. 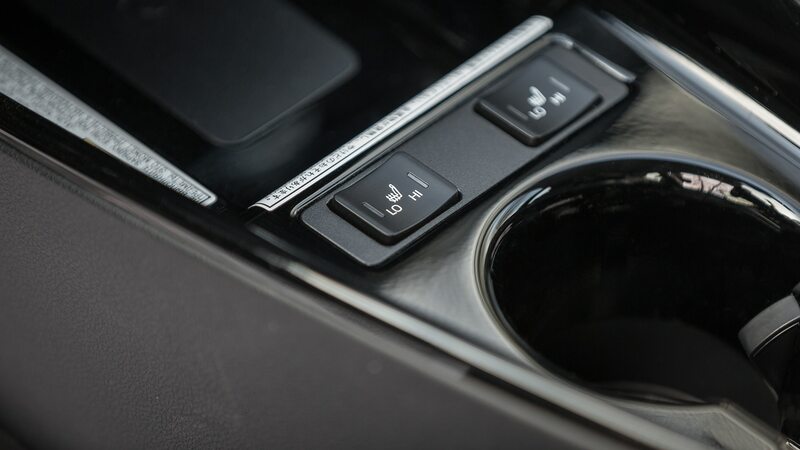 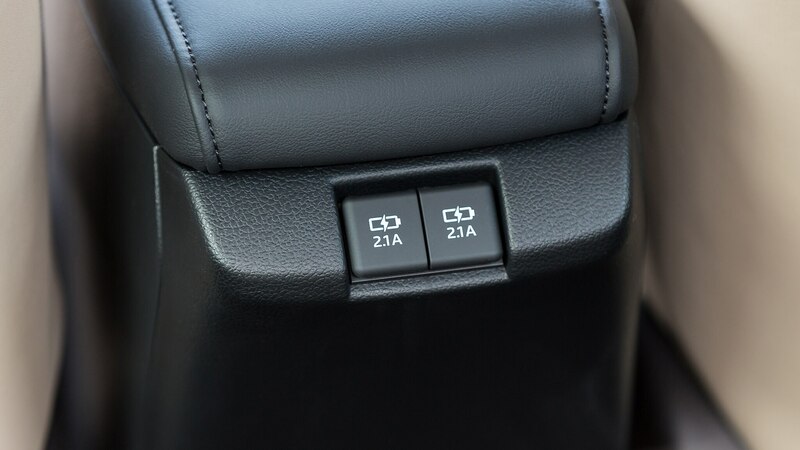 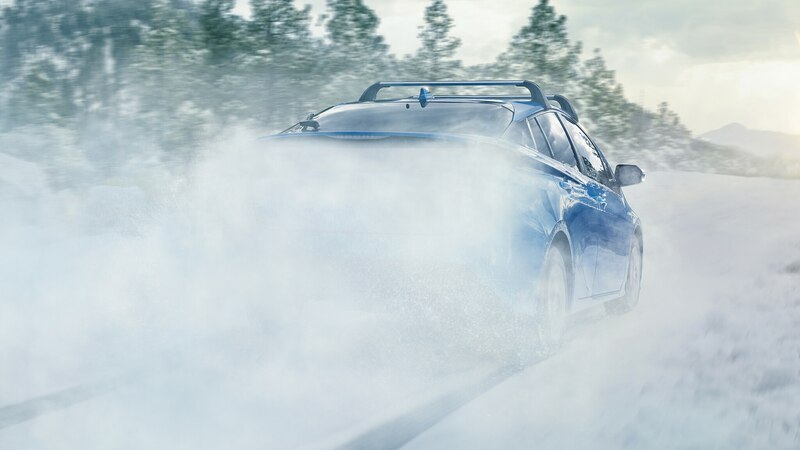 Toyota recognizes that it could make the car more appealing to folks elsewhere, and thus has added an all-wheel-drive variant to help in those areas with cold, snowy, and icy winters. 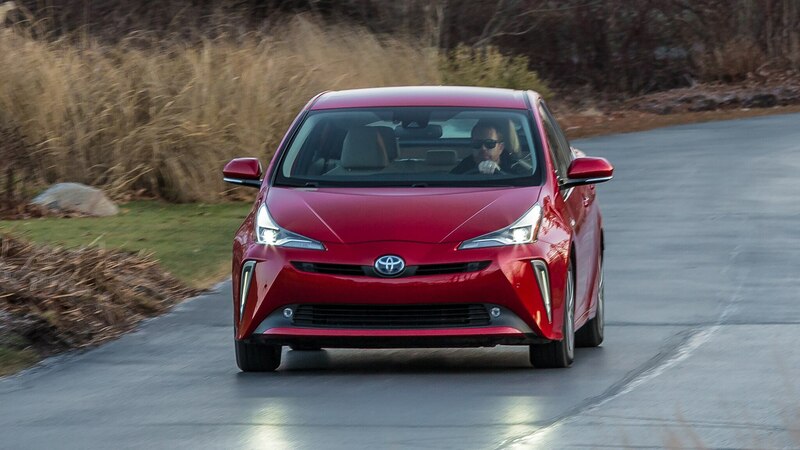 We’ve just driven the resulting new 2019 Toyota Prius AWD-e, which drives its rear wheels via the addition of a second electric motor on the back axle. 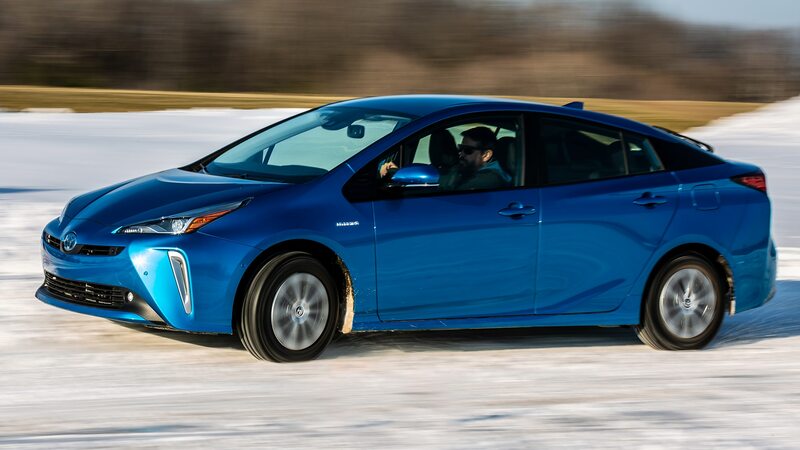 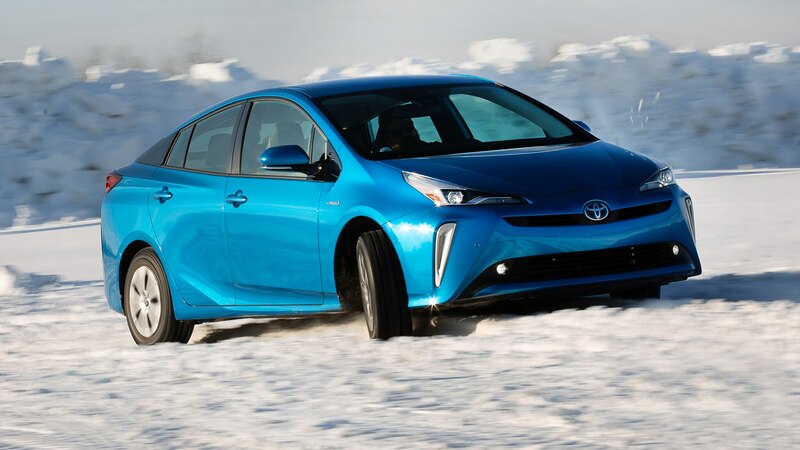 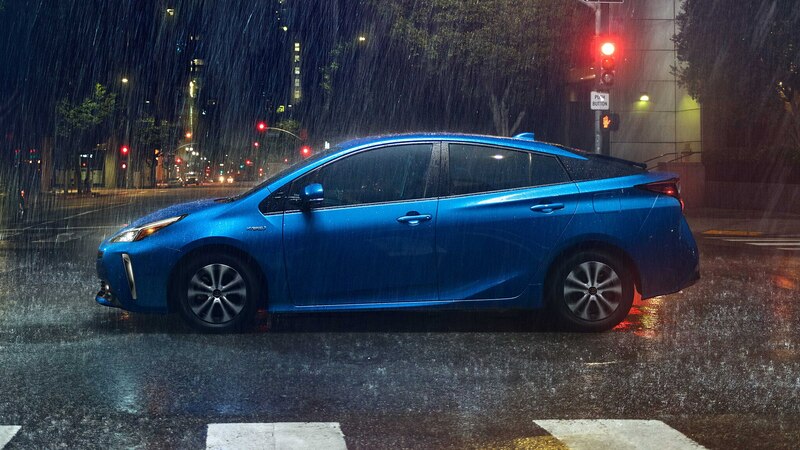 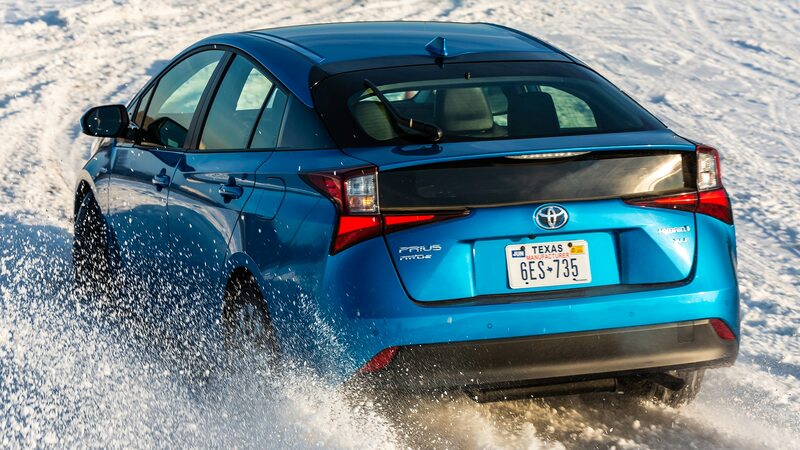 While at the media drive event, we posted an image of the AWD Prius driving in the snow—what? 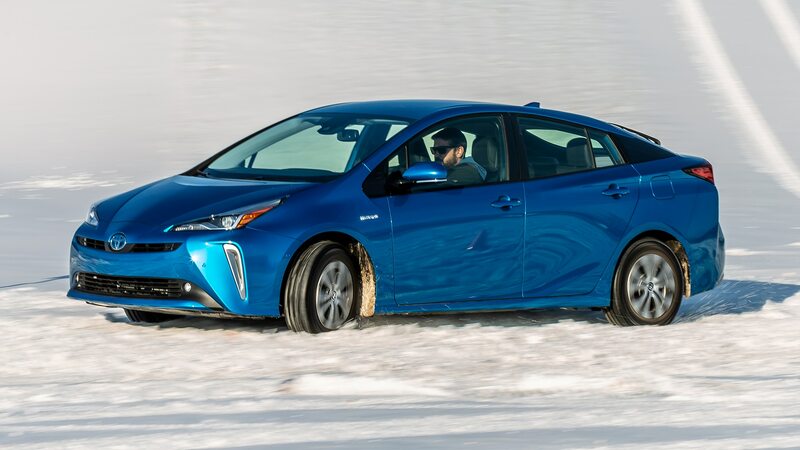 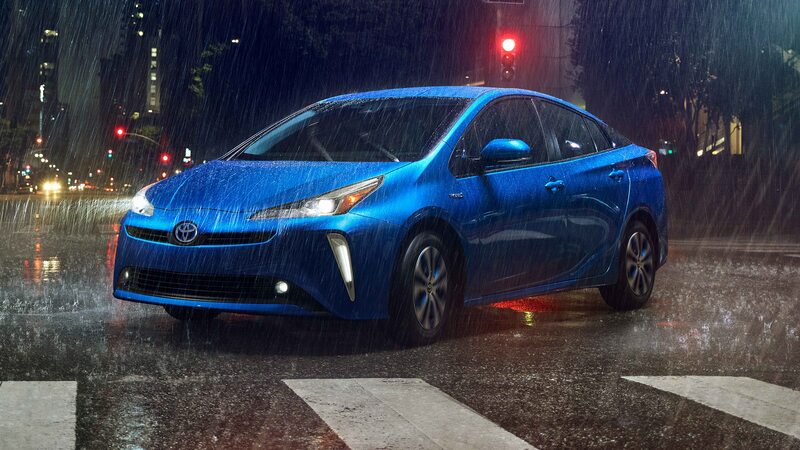 We don’t see snow that often— and one of our followers commented, “I don’t think the ‘noboringcars’ hashtag should be used on this post.” Okay, fair point, but the technology and innovation that went into Toyota’s first-ever AWD Prius makes it worth exploring further. 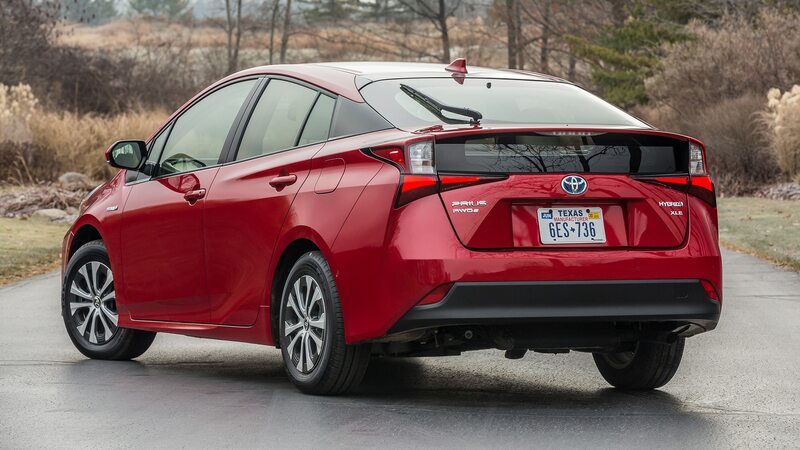 The AWD-e model carries over the FWD car’s 1.8-liter four-cylinder gasoline engine, but it now teams with two electric motors to achieve the same 121 horsepower and 105 lb-ft of torque. 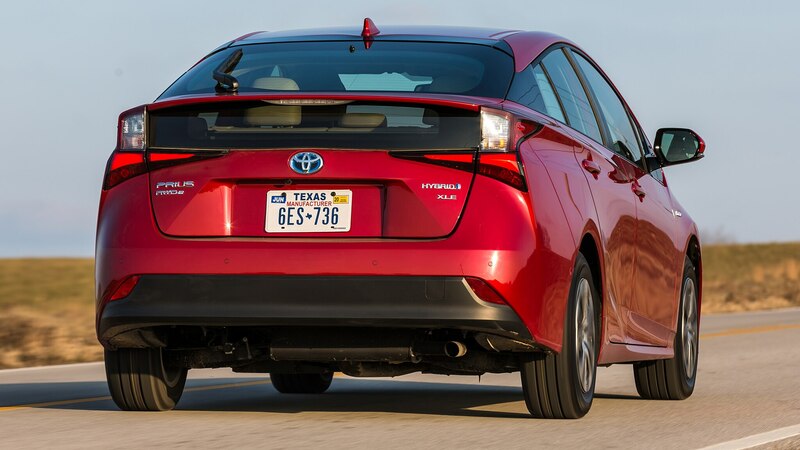 The rear electric motor is mechanically separate from the rest of the powertrain, and it is intended mostly to aid off-the-line traction. 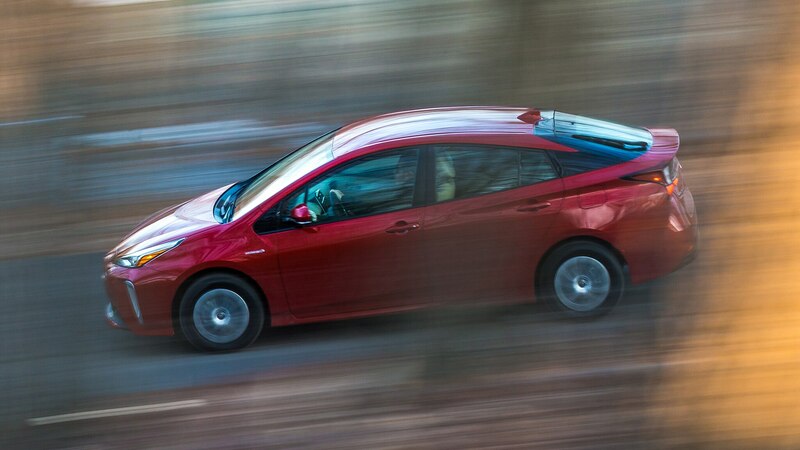 It is always active up to 6 mph, during which time it contributes an extra 7 horsepower and 41 lb-ft of its own. 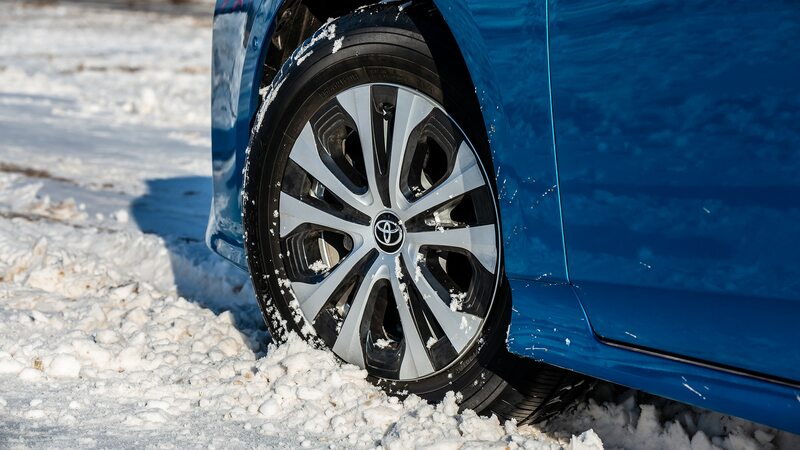 Above that speed and until 43 mph, it will activate if wheel slippage is detected, and is completely idle after 43 mph. 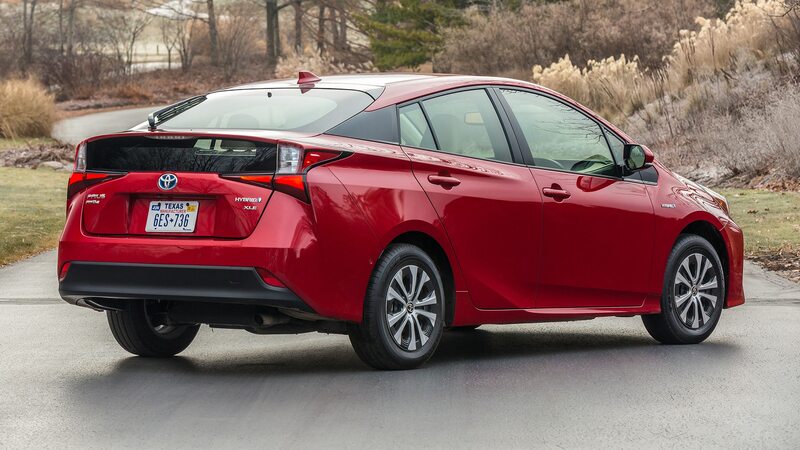 The upper speed limit for when the rear motor operates was chosen by Toyota’s engineers as a compromise between aiding the car’s capability in bad conditions and maximizing overall fuel economy. 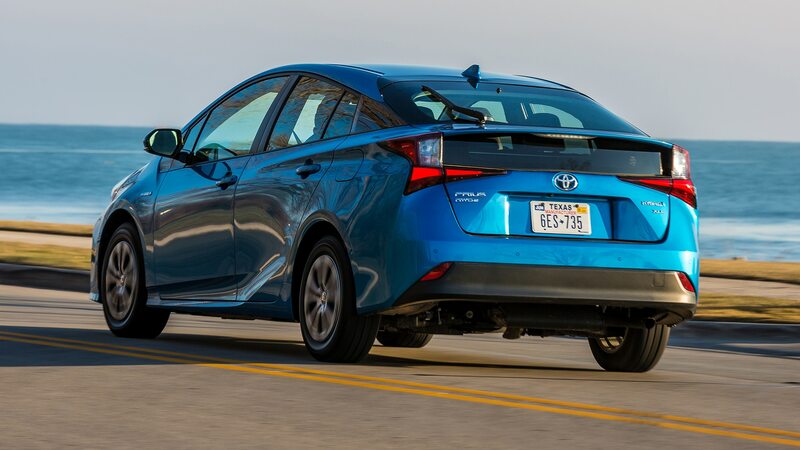 The AWD variant still achieves an impressive combined 50-mpg EPA rating, a penalty of a mere 2 mpg over the least-efficient front-wheel-drive model. 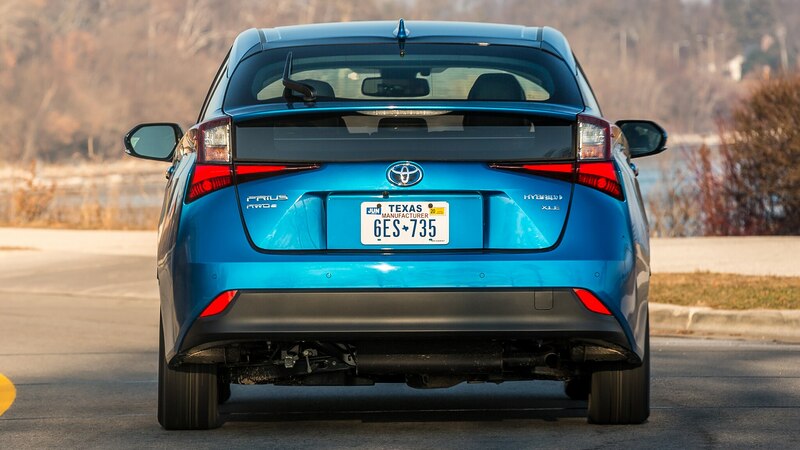 Conventional cars powered only with a combustion engine, such as the Subaru Crosstrek—which Toyota noted as a competitor to the Prius—only average EPA ratings of 27 mpg city and 33 mpg highway, the company says. 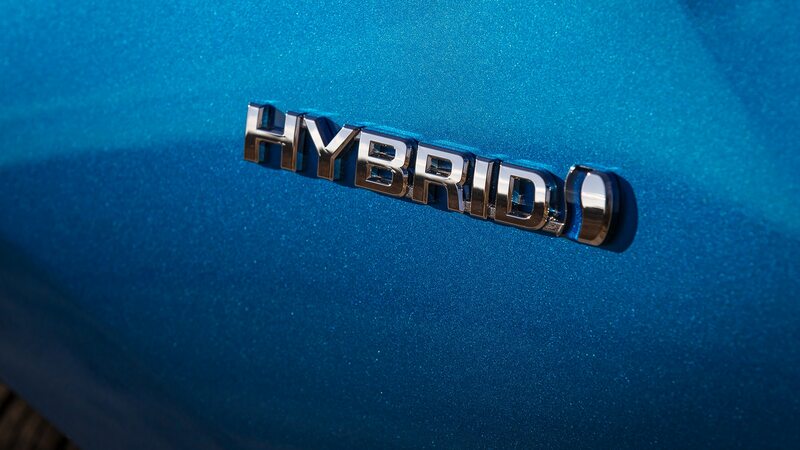 (Of course, the Subaru model Toyota cited is available as a plug-in hybrid, but that one still only attains 35 mpg combined.) 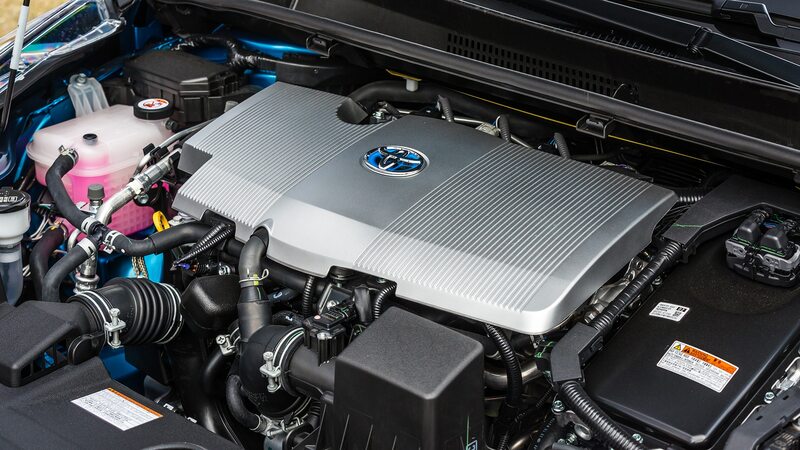 In a bid to further guarantee efficiency in the cold, Toyota subbed out the lithium-ion battery pack for a nickel-metal-hydride one that offers improved operation when temperatures dip down low. 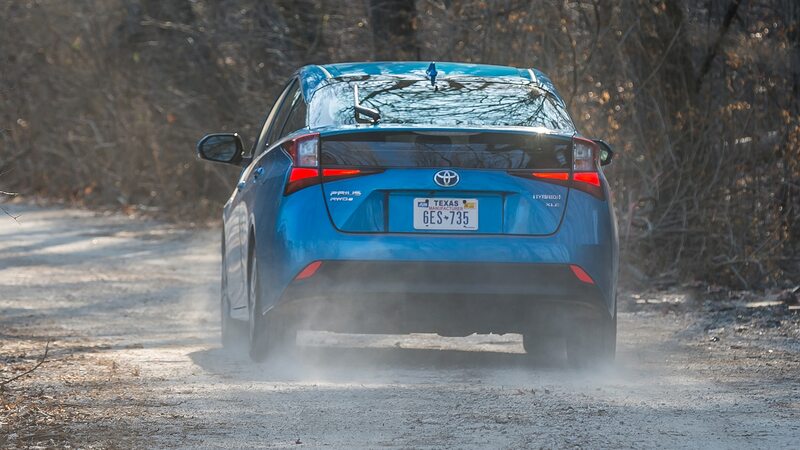 With the extra weight of the rear motor and other componentry, AWD-e cars are about 150 pounds heavier and less nimble than their FWD stablemates in normal driving conditions. 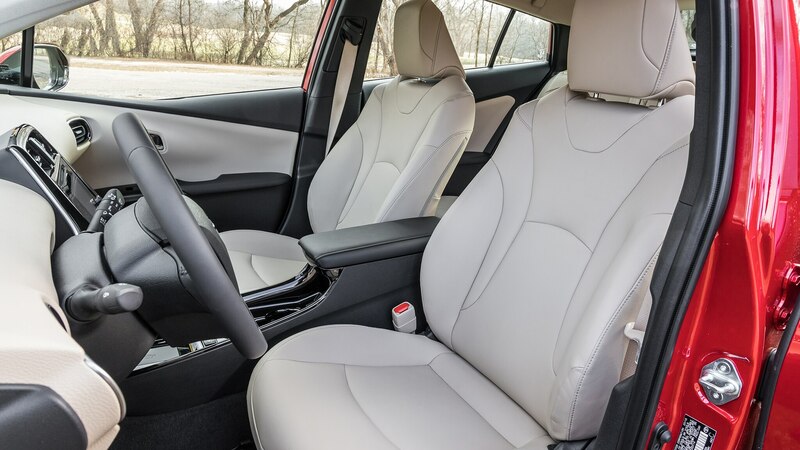 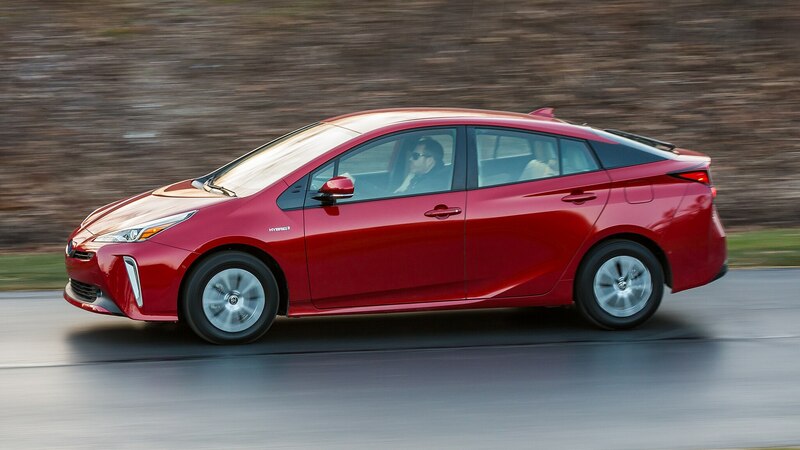 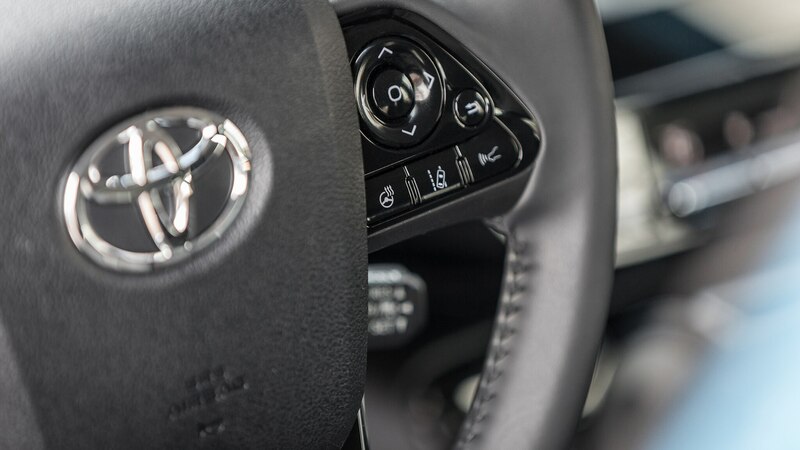 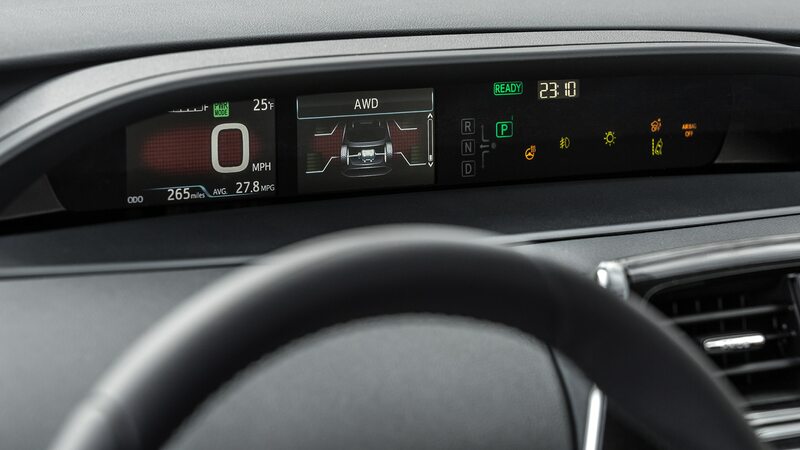 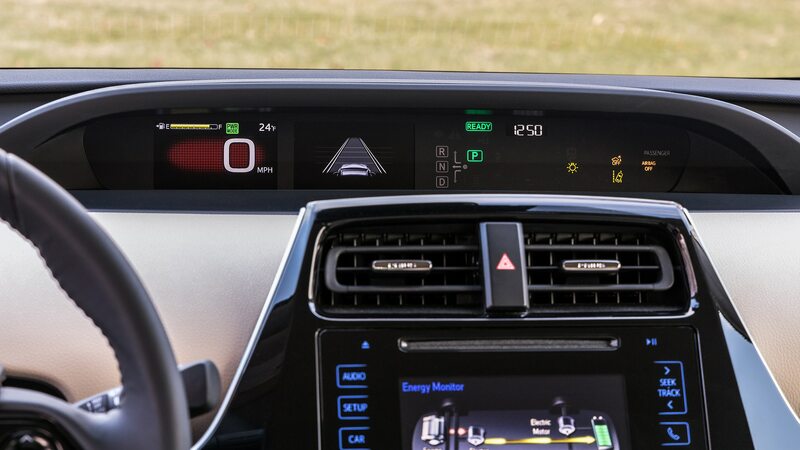 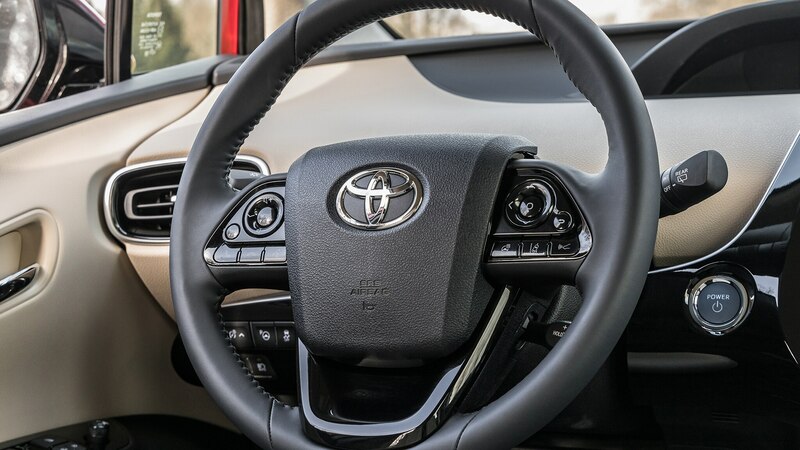 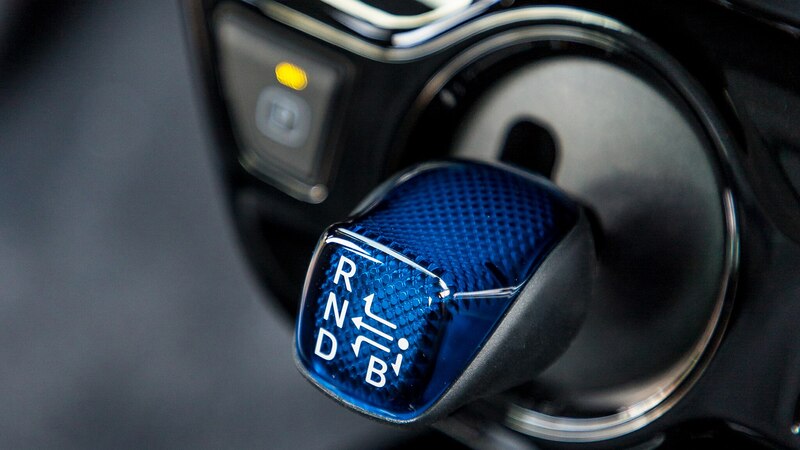 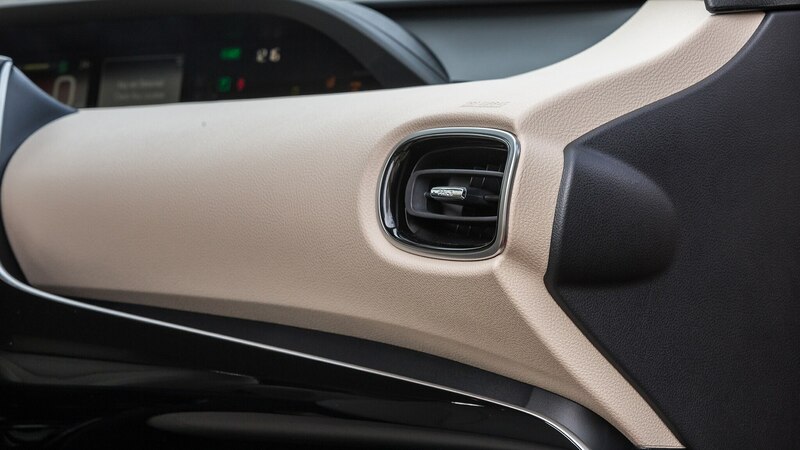 Steering feel remains nothing exceptional but both versions of the Prius drive well enough and feel secure and stable for a typical day-to-day duty cycle. 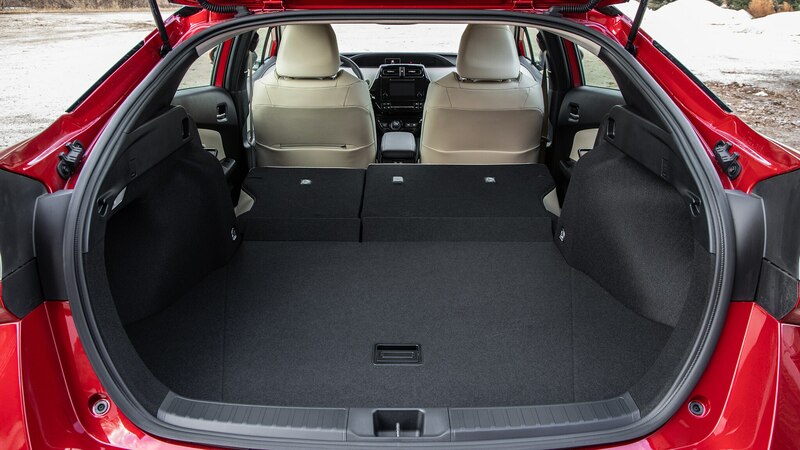 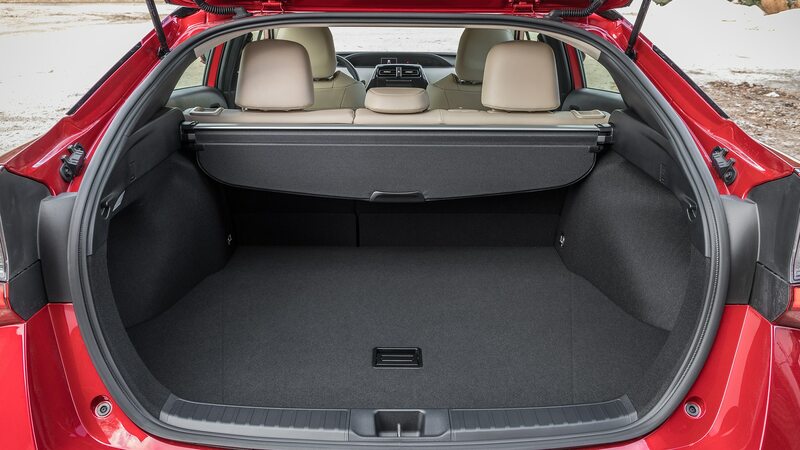 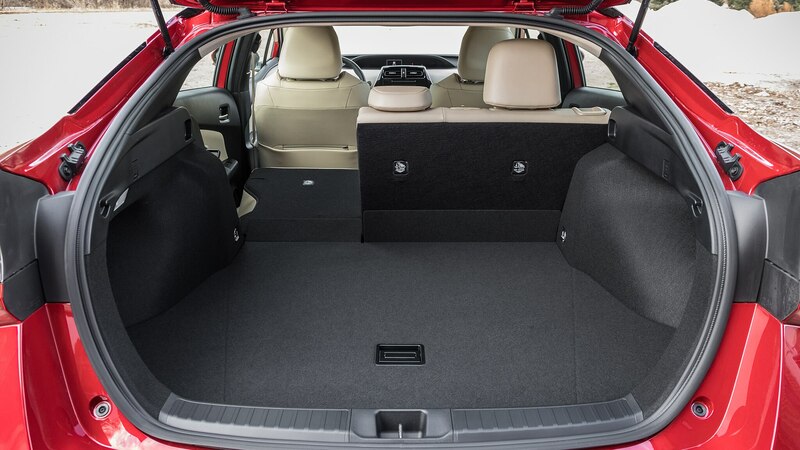 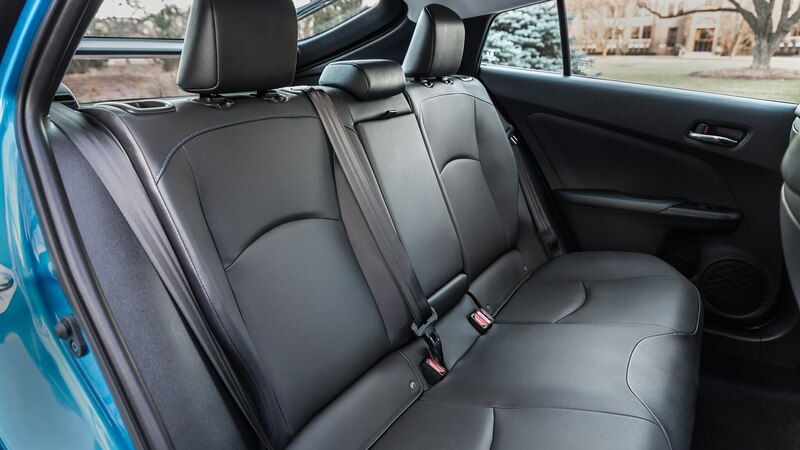 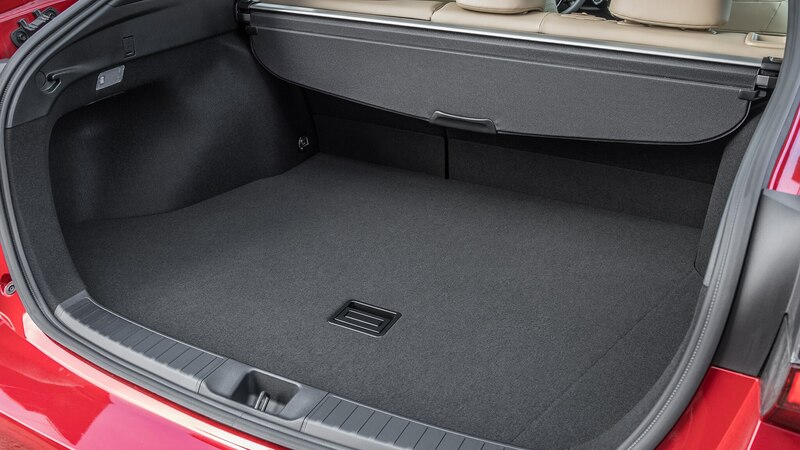 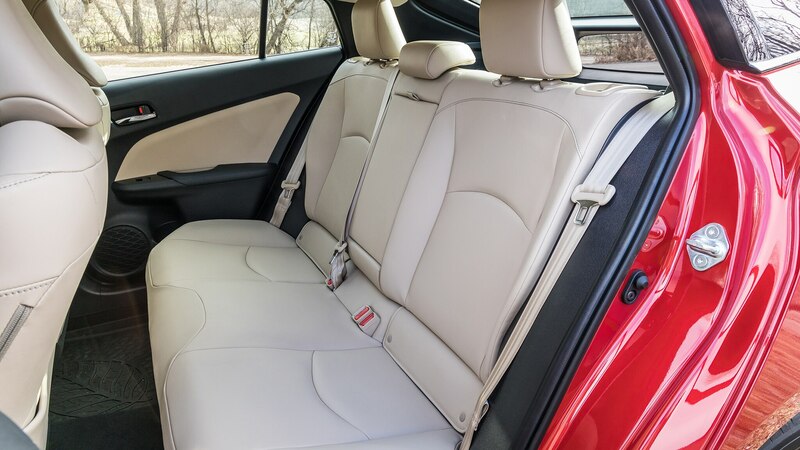 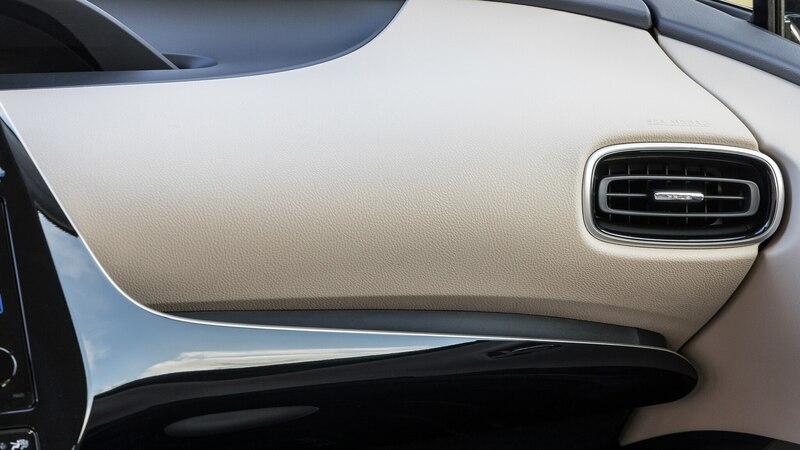 A nice touch is that the new electric motor does not impinge on cabin or cargo space. 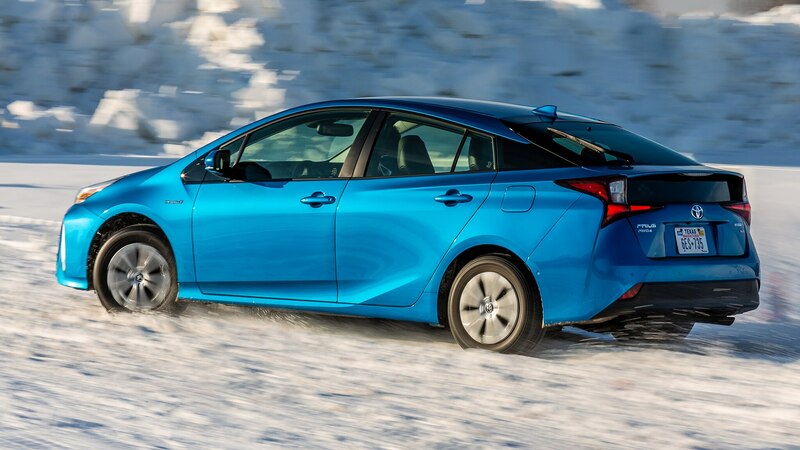 Yet when we drove both variants of the Prius back-to-back on a snow course, the rear motor’s assistance is an obvious improvement. 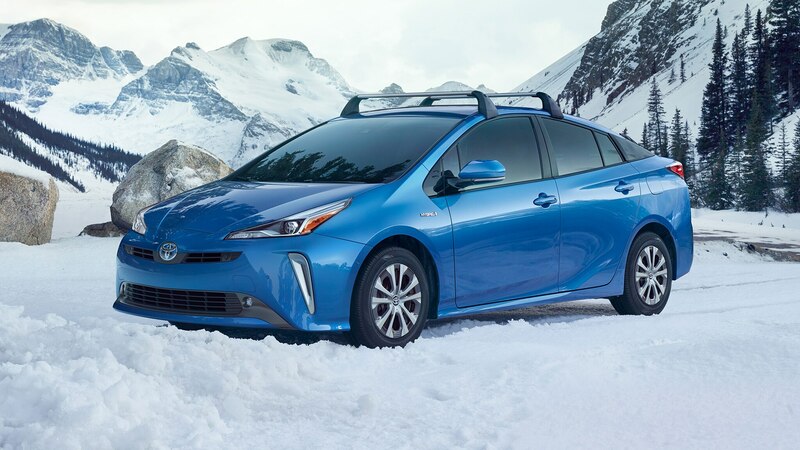 Our experience started with tackling a steep, snowy incline, where we were asked to drive halfway up and come to a complete stop, then ascend the rest of the hill with the AWD system doing the work. 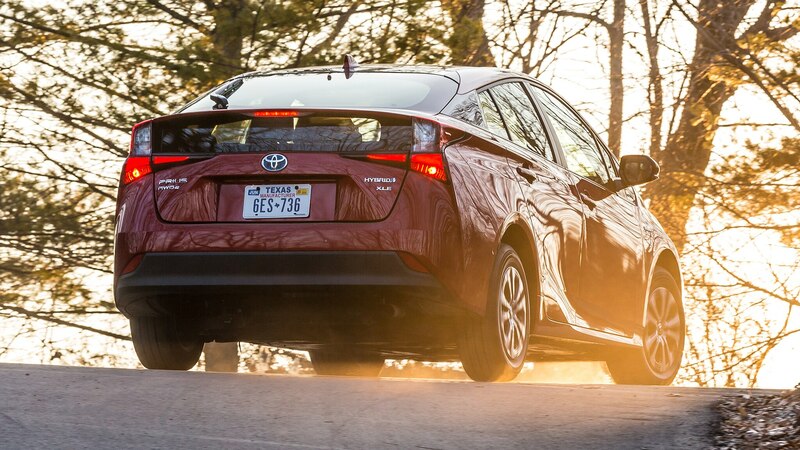 While all four wheels clamored for traction, we crested the slope. 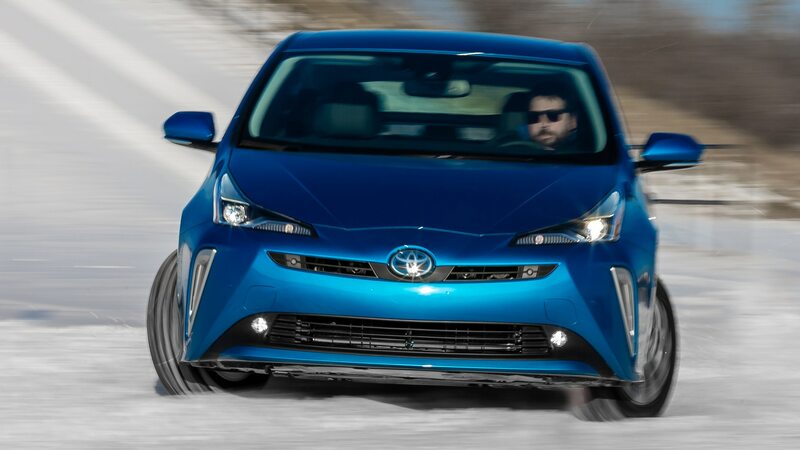 Unfortunately, Toyota didn’t allow us to test the FWD variant on the same slope, as they said it was completely incapable of making it over the hump. 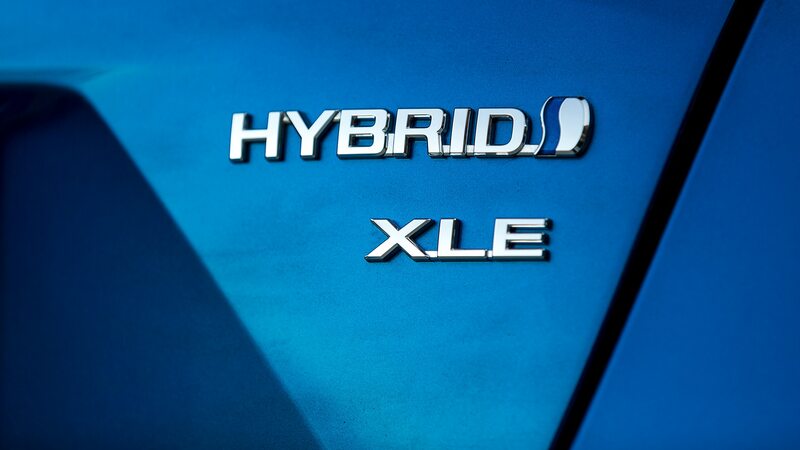 Still, we’d have liked to have tried. 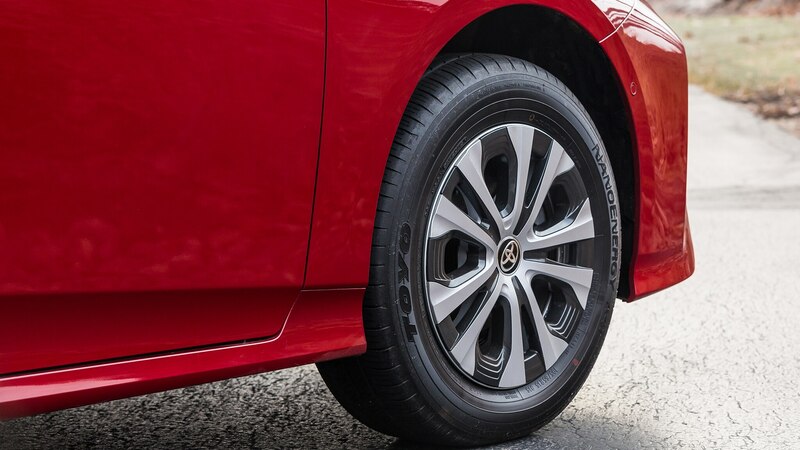 In the other exercises where the FWD was allowed to compete, all cars were fitted with the standard low-rolling-resistance tires, making for a proper A-B test. 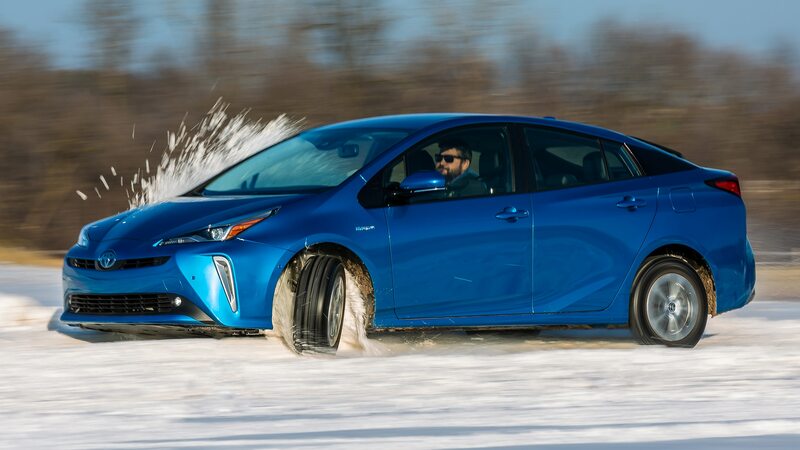 When we pushed both versions of the Prius through ess curves on a snowy track, the FWD car understeered incessantly, the car pushing wide of our intended line at all but the lowest speeds. 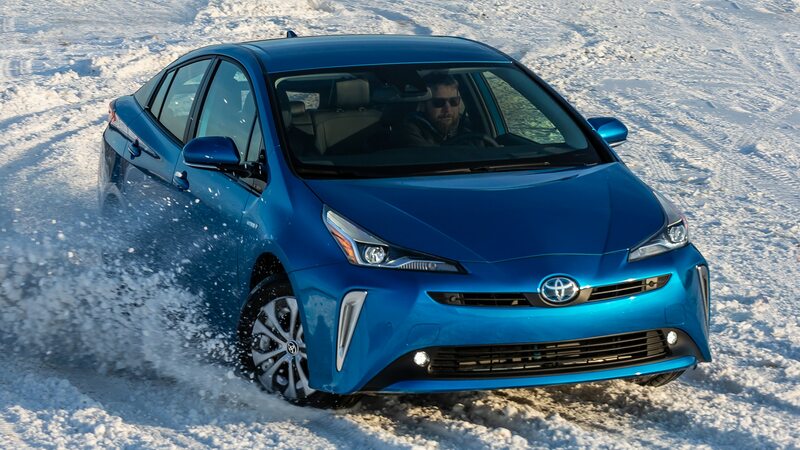 Even with this native Californian and snow-driving novice behind the wheel, the AWD-e cars had no problem tracking true on this part of the course. 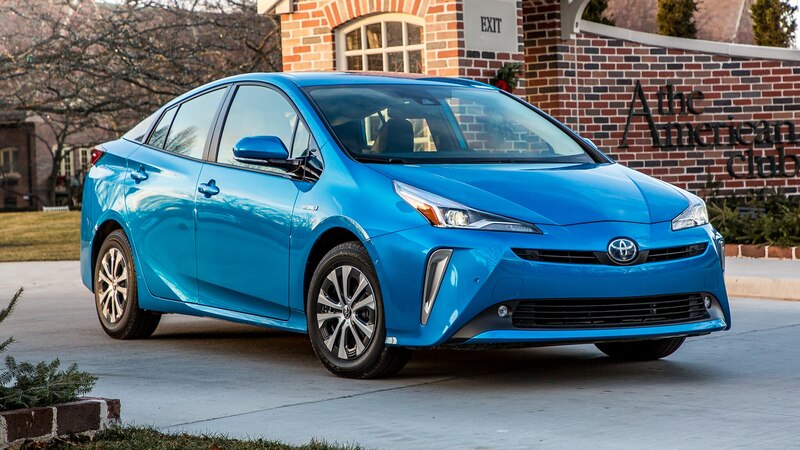 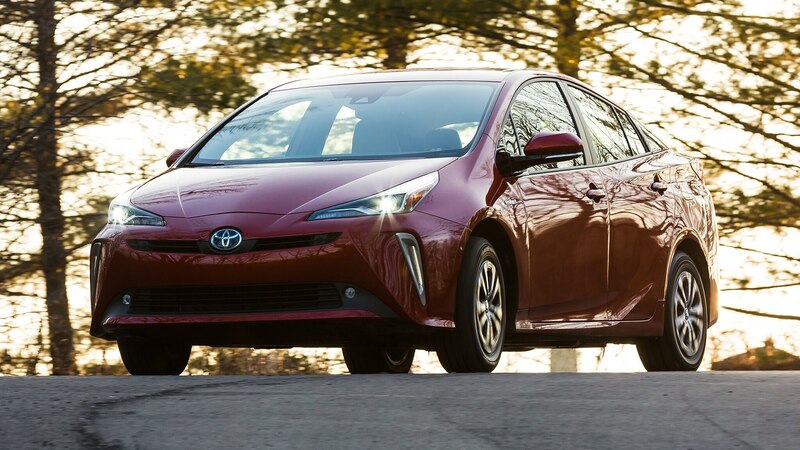 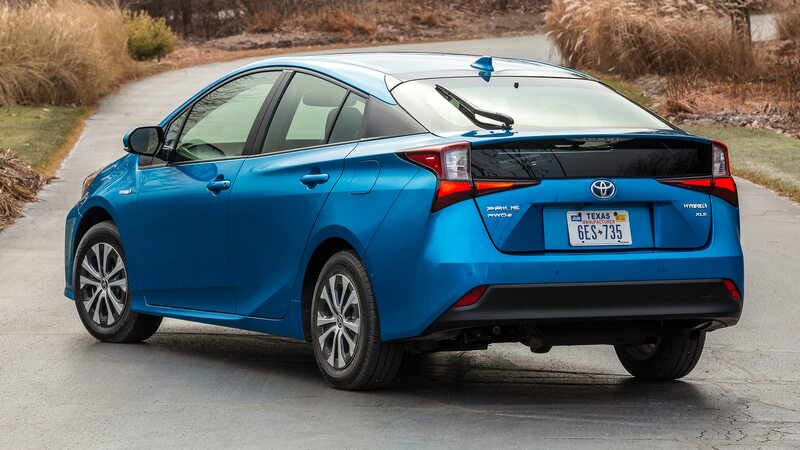 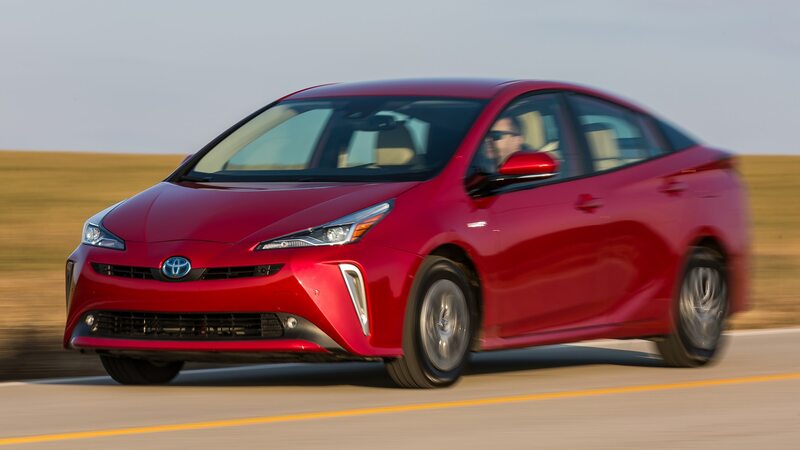 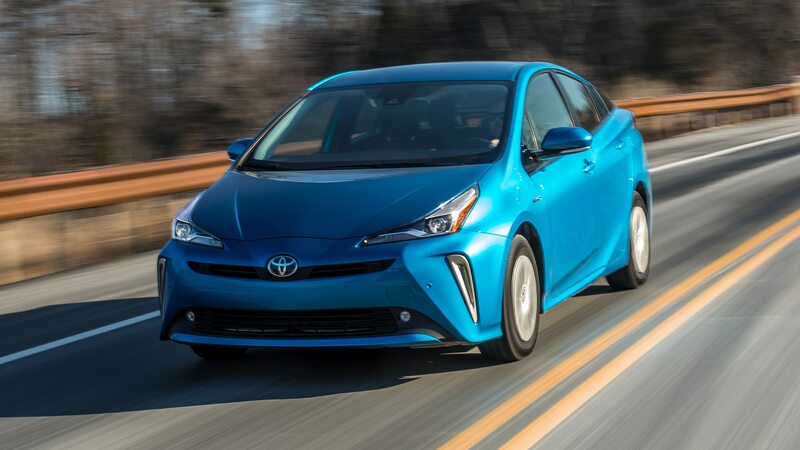 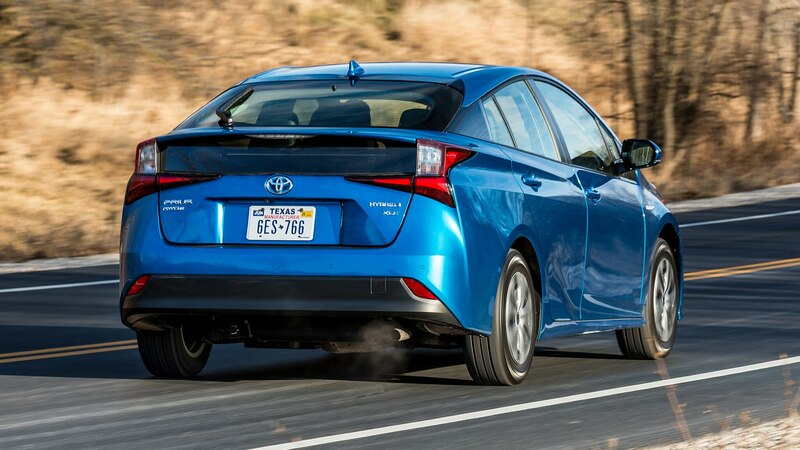 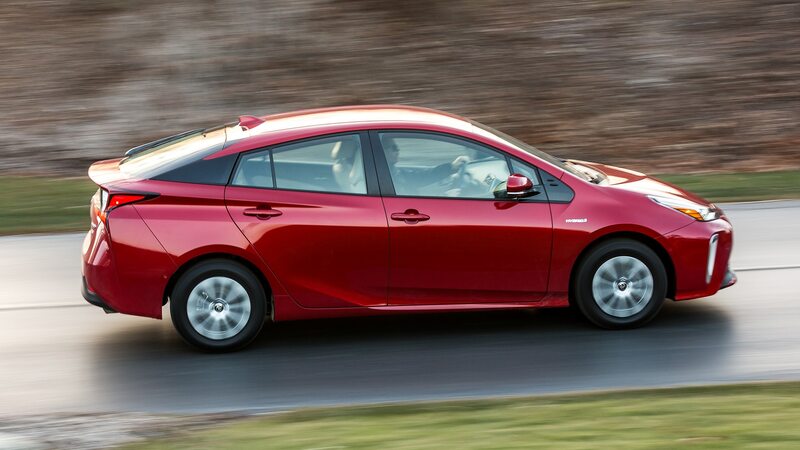 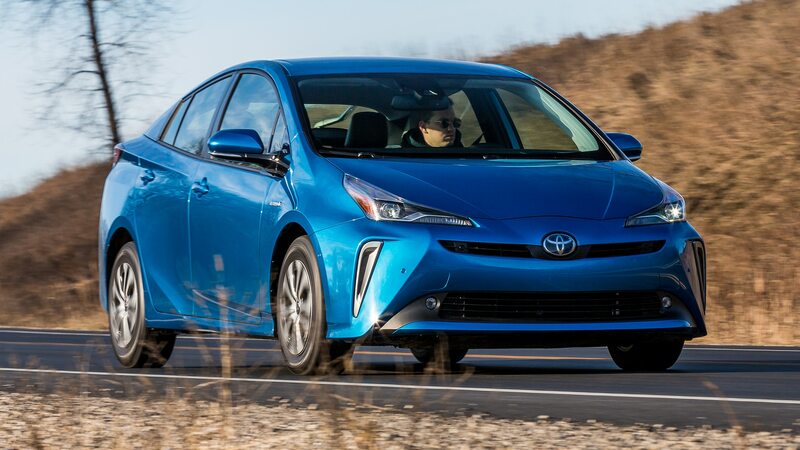 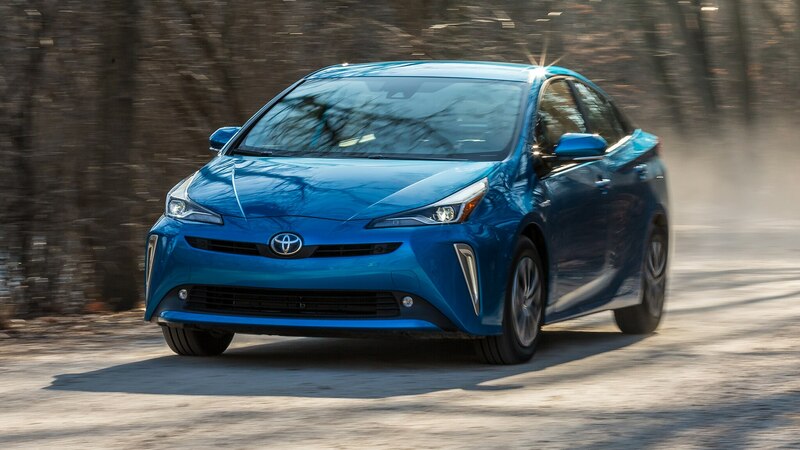 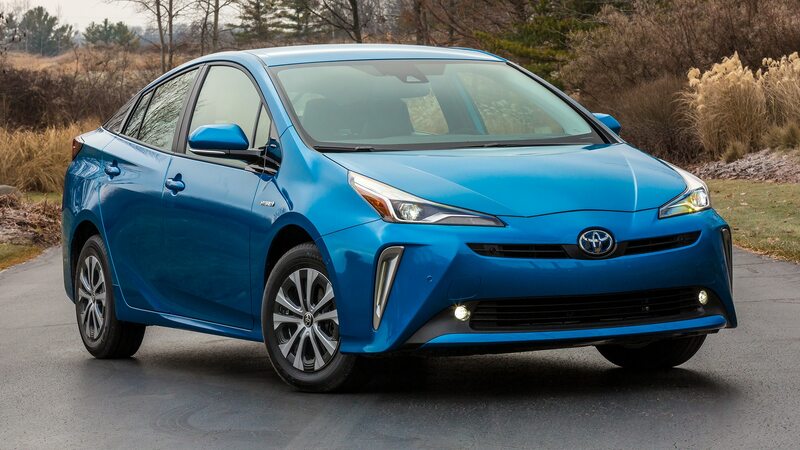 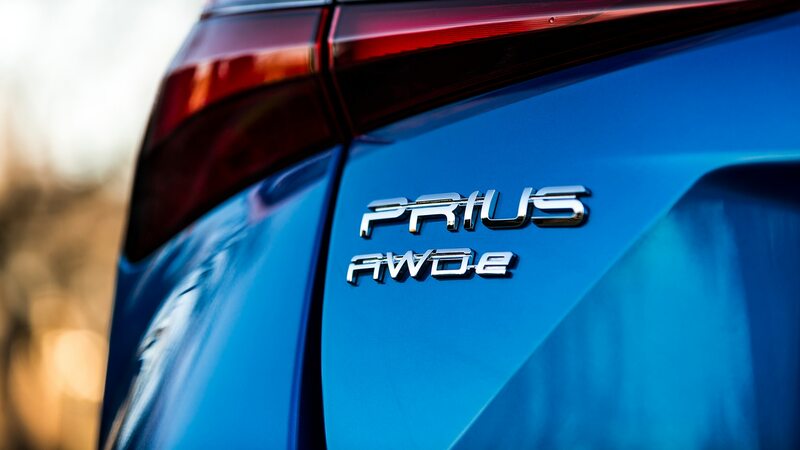 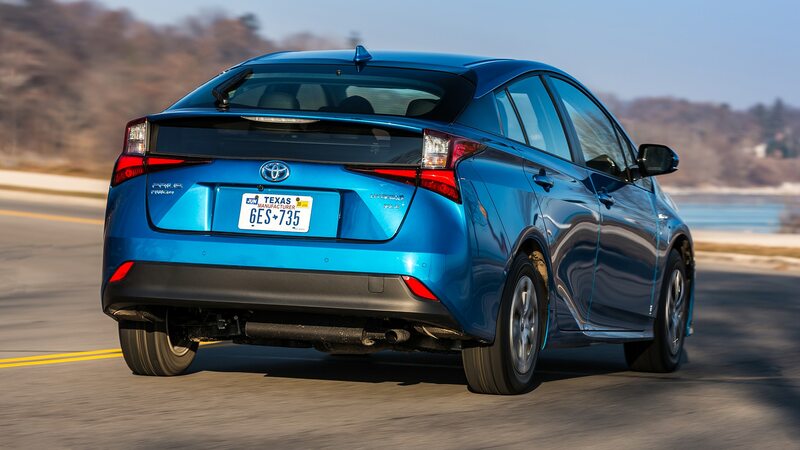 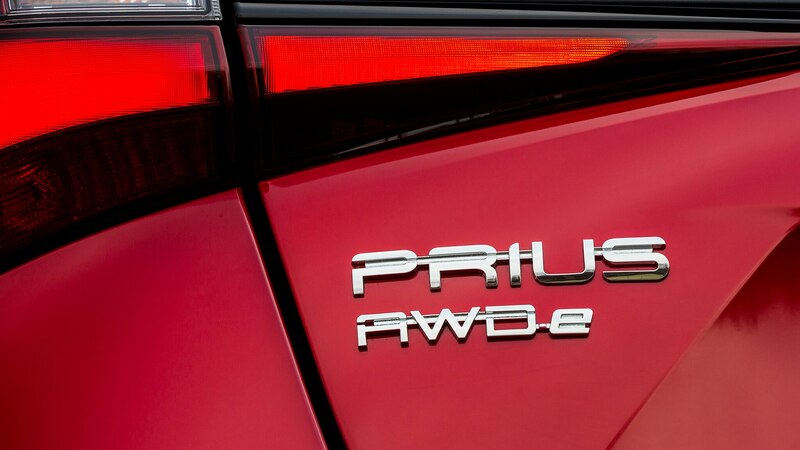 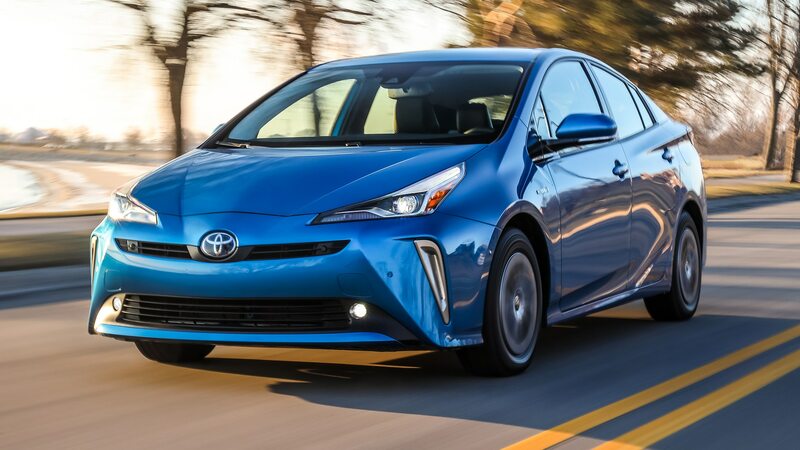 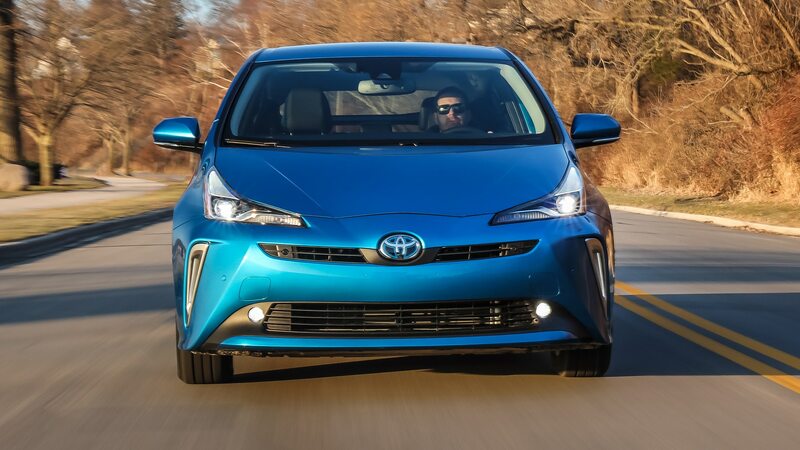 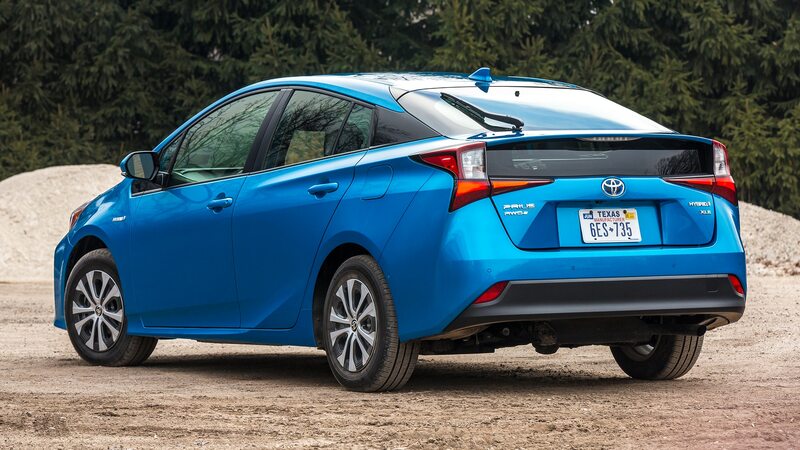 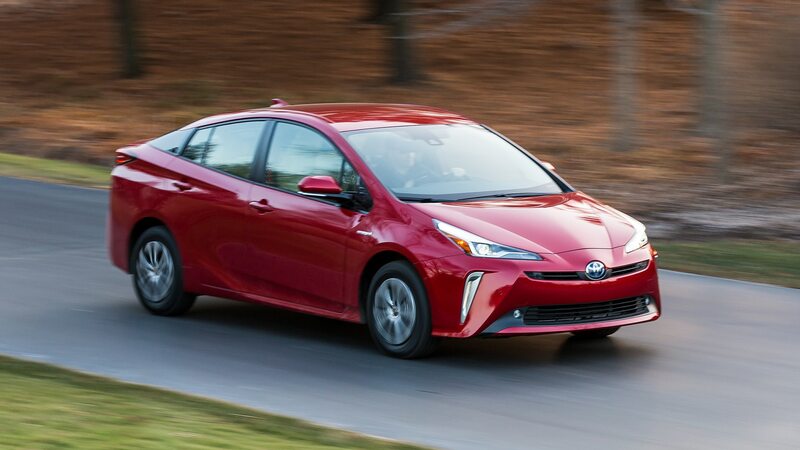 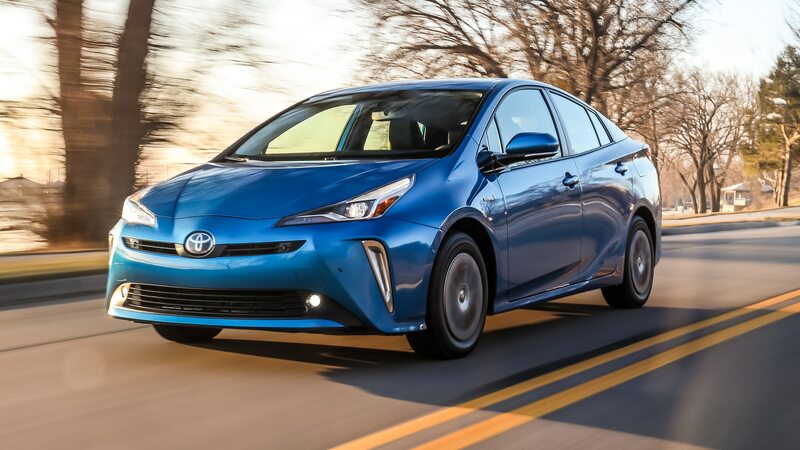 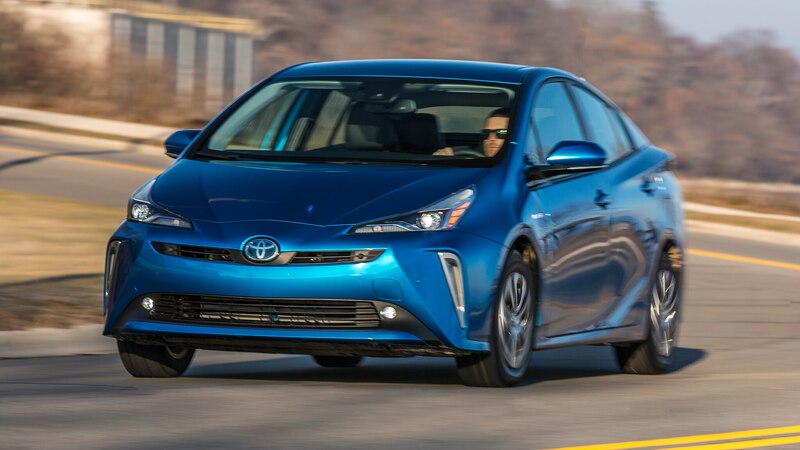 The addition of an AWD model also ushers in a smattering of other changes to the full 2019 Prius line. 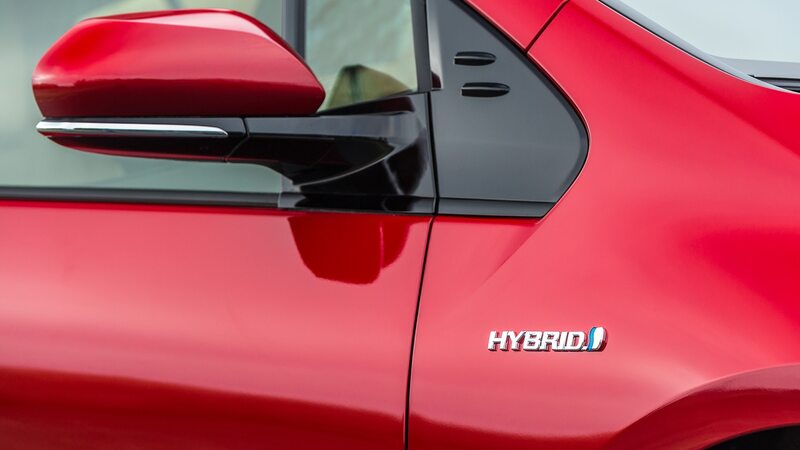 Rather than frankly silly names such as Two, Three, and Four, the models now fall in line with the rest of the brand’s nomenclature. 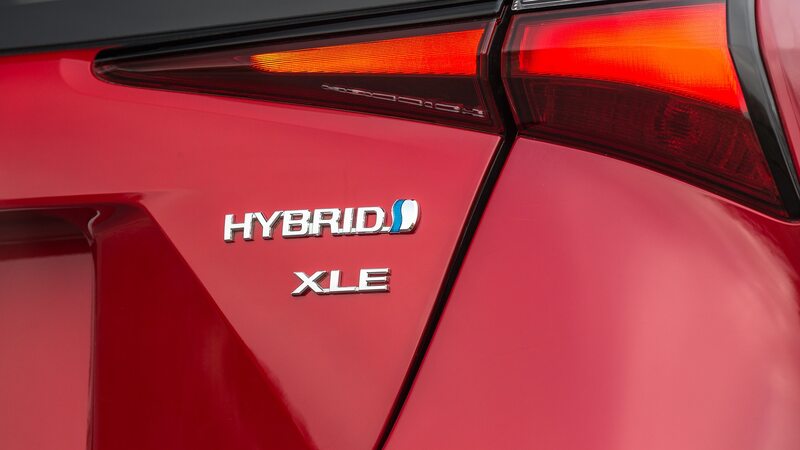 That means L Eco will describe the base model and LE, XLE, and Limited round out the rest. 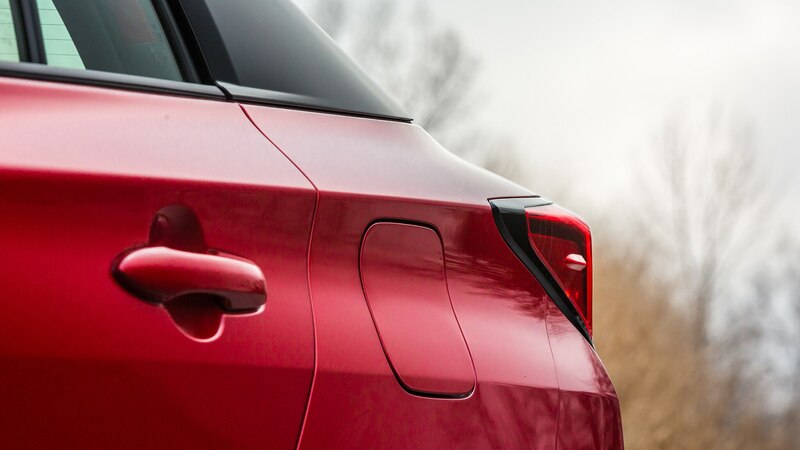 The exterior has been revised to be far less funky both front and rear, as reception to this generation’s radical departure from its predecessor’s simple and slippery silhouette wasn’t particularly well received. 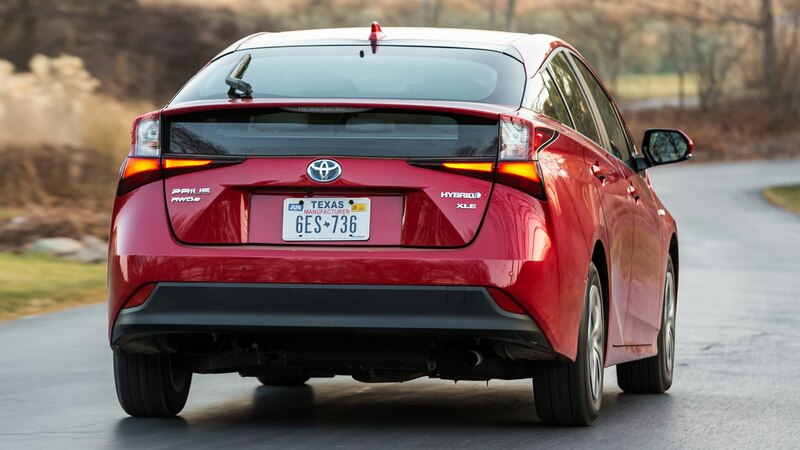 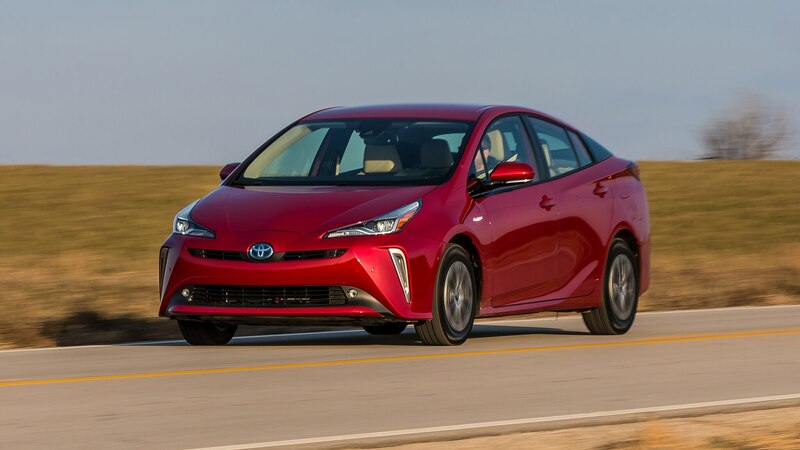 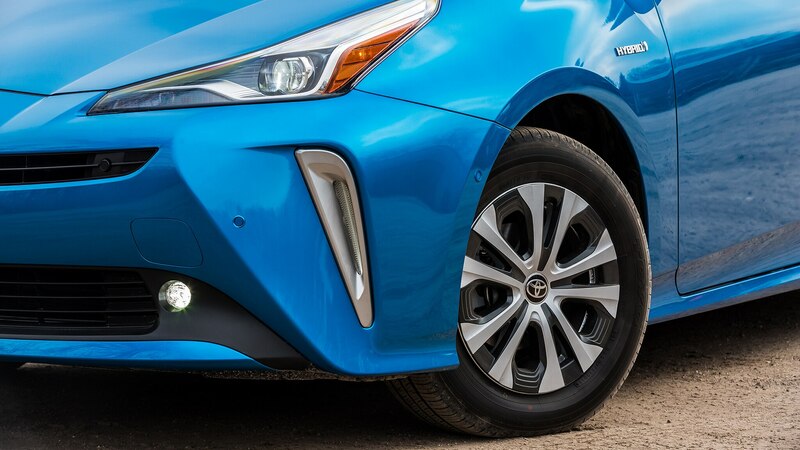 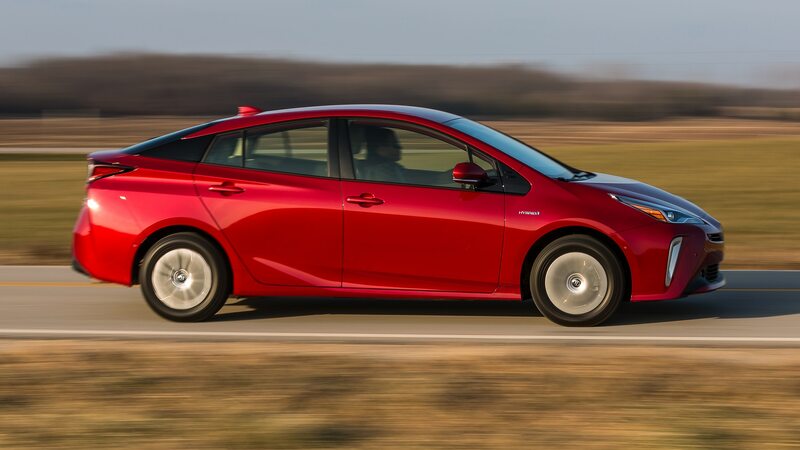 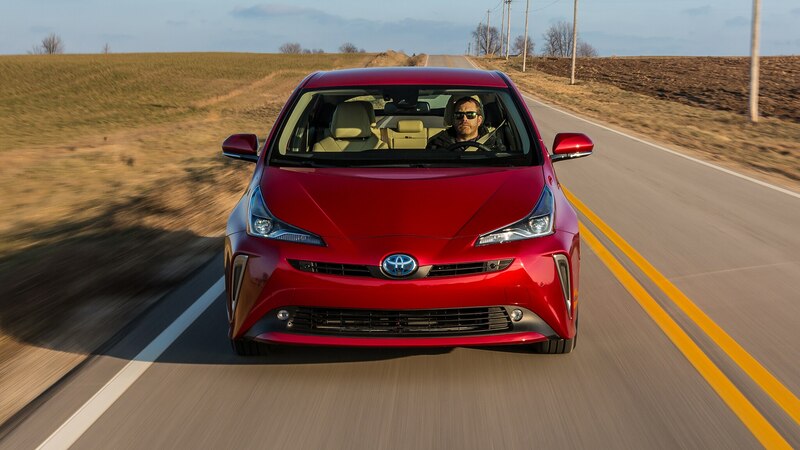 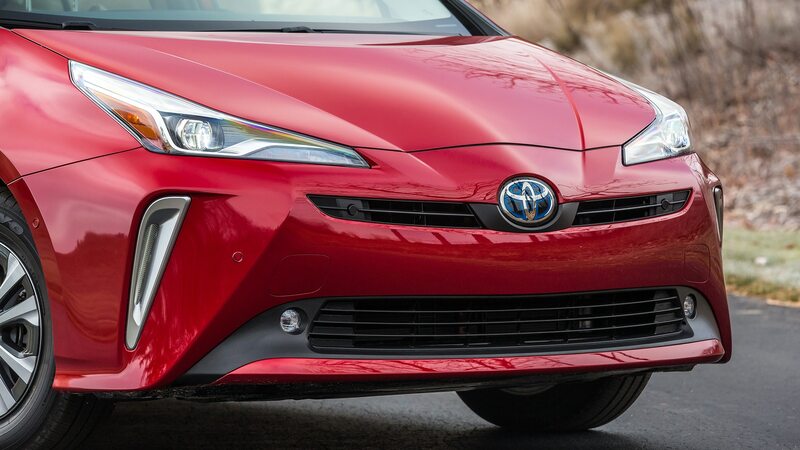 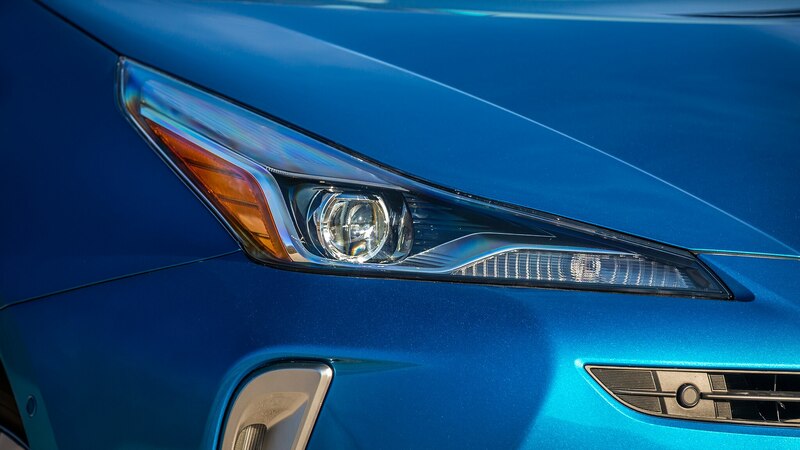 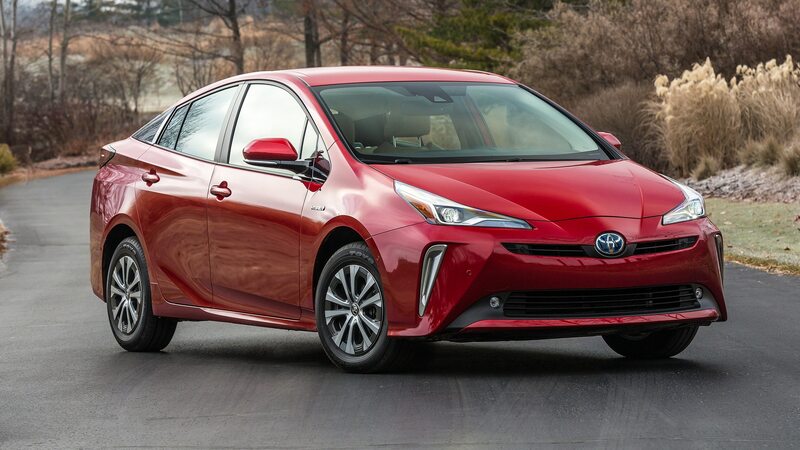 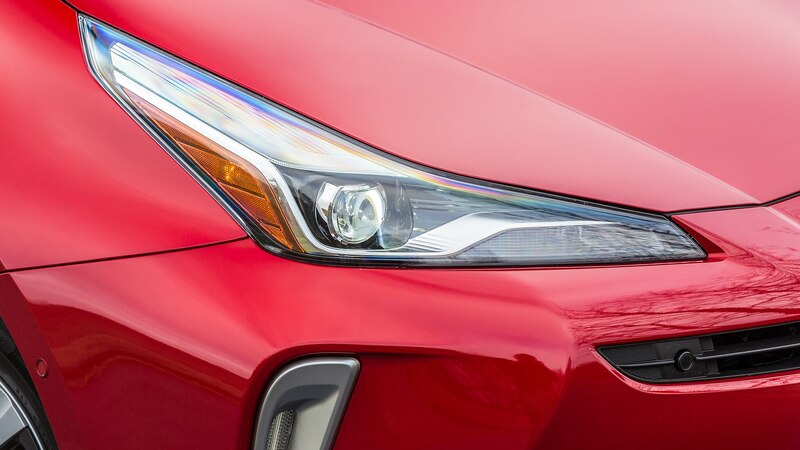 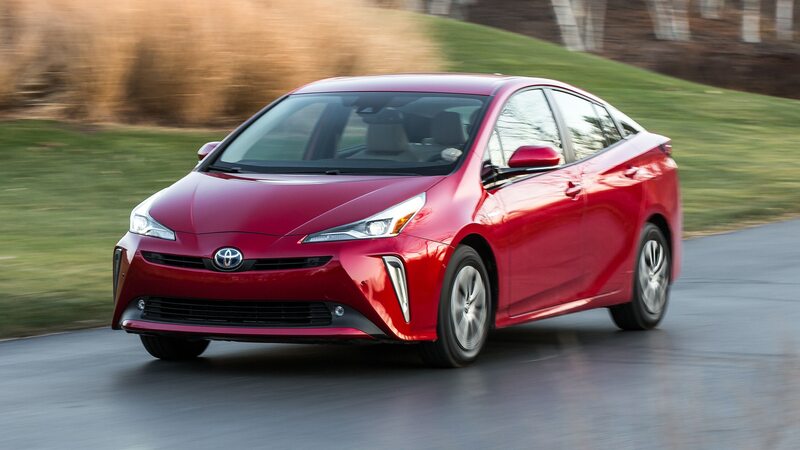 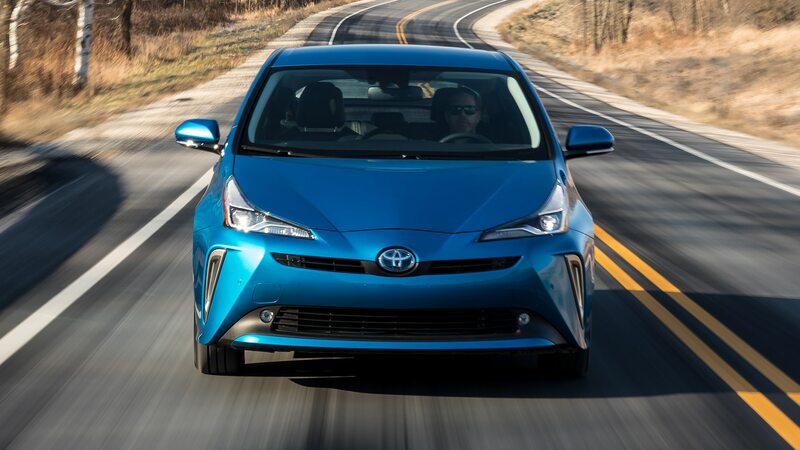 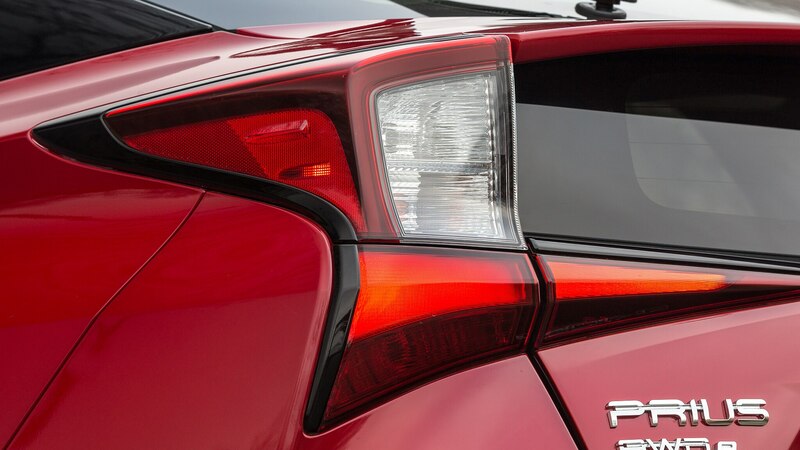 Calling the 2019 facelift “cleaned up,” the changes include simplified head- and taillight shapes and a trapezoidal front fascia that brings the Prius aesthetically closer to the rest of the Toyota range. 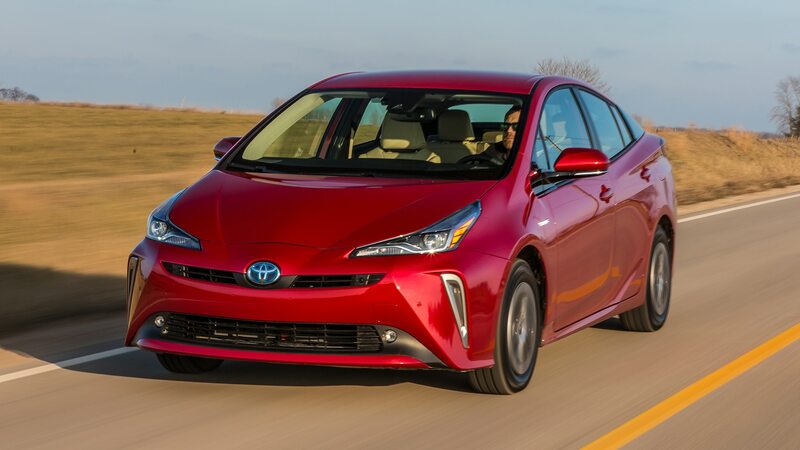 The 2019 Prius family goes on sale in January, with pricing starting at $24,690 with front-drive and at $27,300 for the AWD-e version. 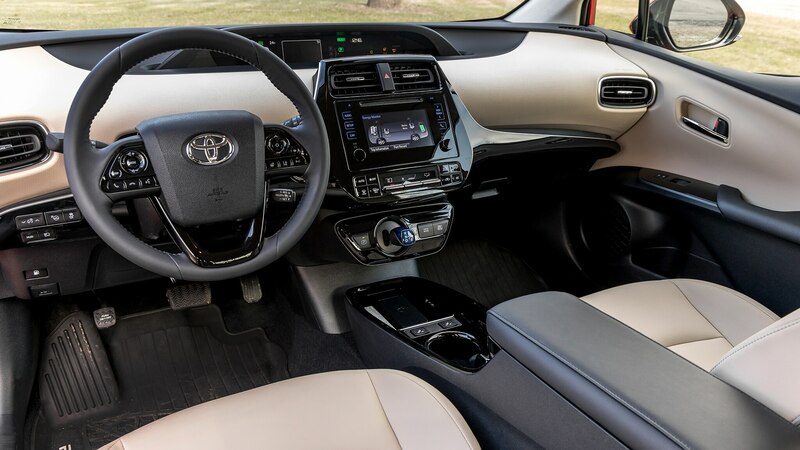 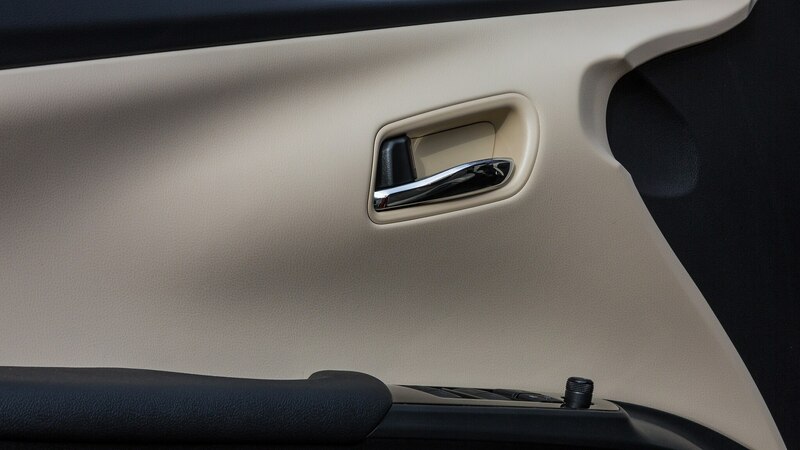 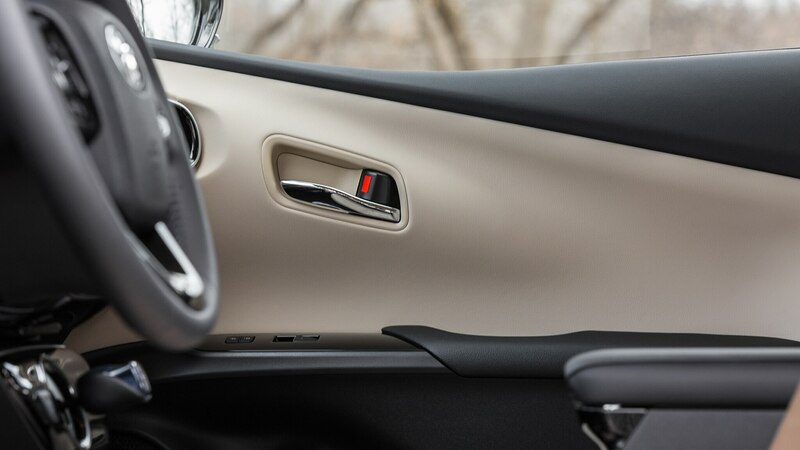 On the inside, a light revision includes substituting piano black plastic on the center console for the more outgoing white trim from before. 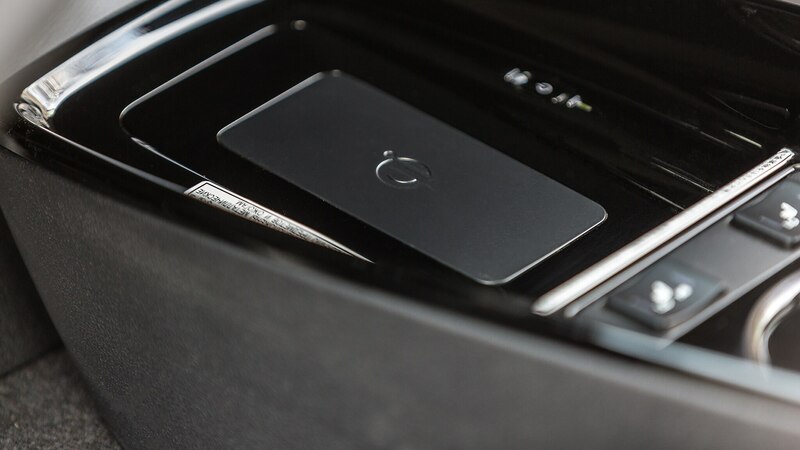 Two additional USB 2.1 ports have been added, along with a Qi wireless phone-charging pad. 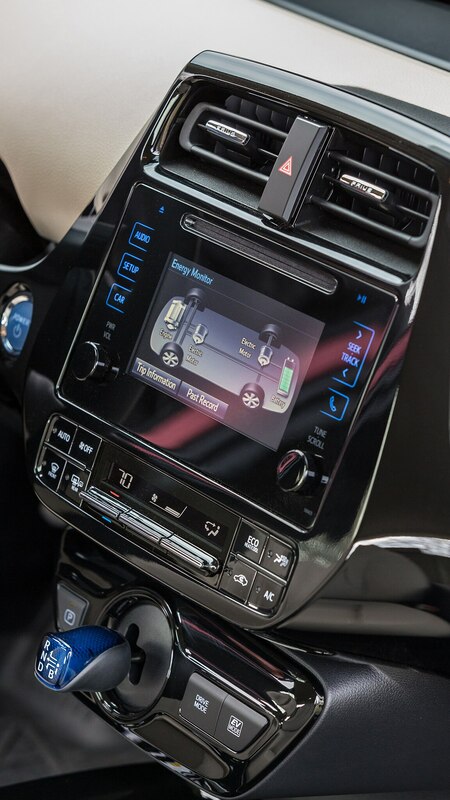 The standard 4.2-inch infotainment display remains, though, and is one of the weakest points of the entire package. 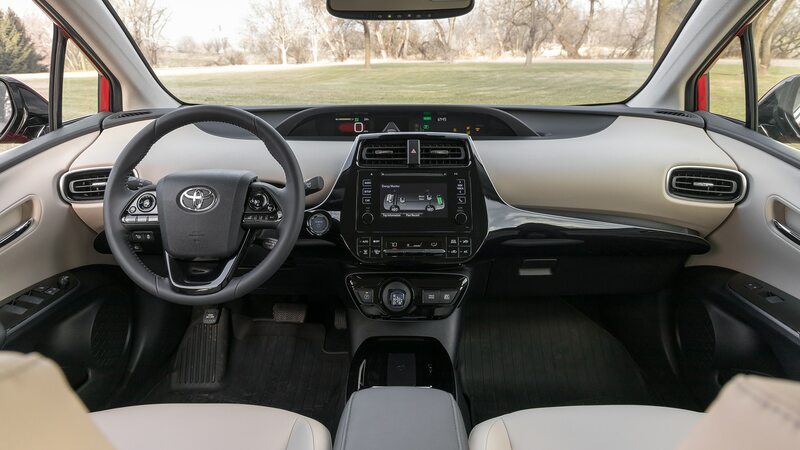 Its poor graphics and slow touchscreen responses can be partially remedied by upgrading to the Limited and its high-resolution 11.6-inch display, but that cost, you know, more money. 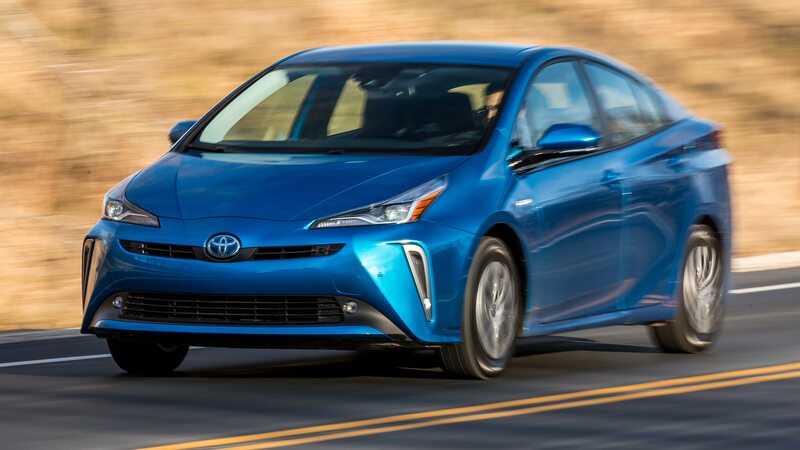 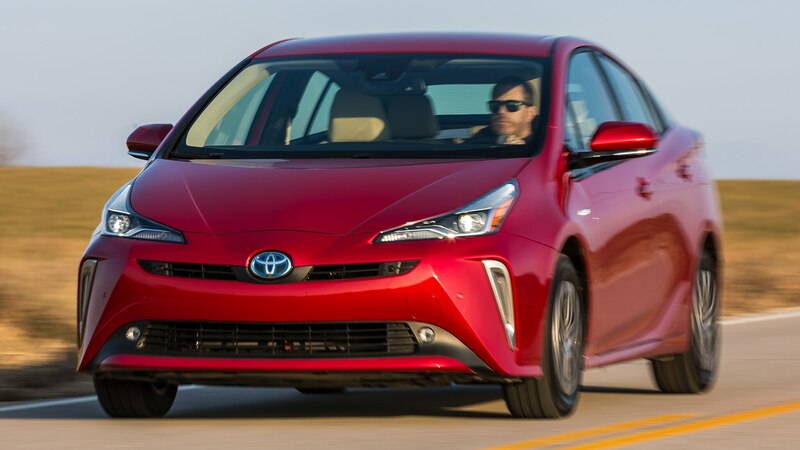 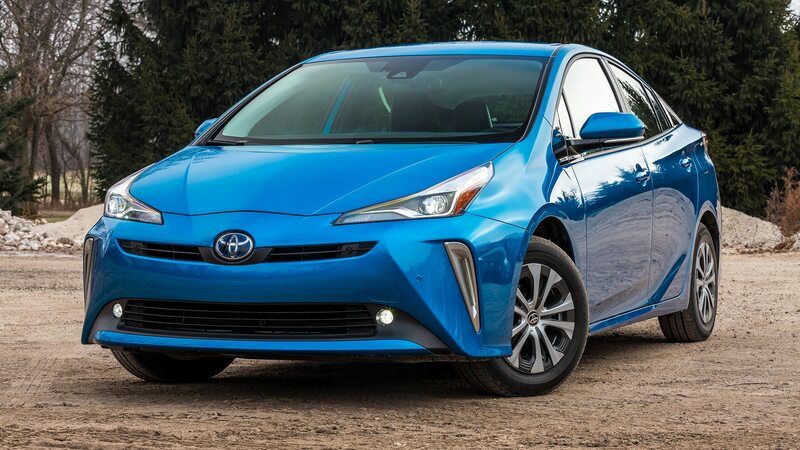 Android Auto and Apple CarPlay are still not available in Prius models. 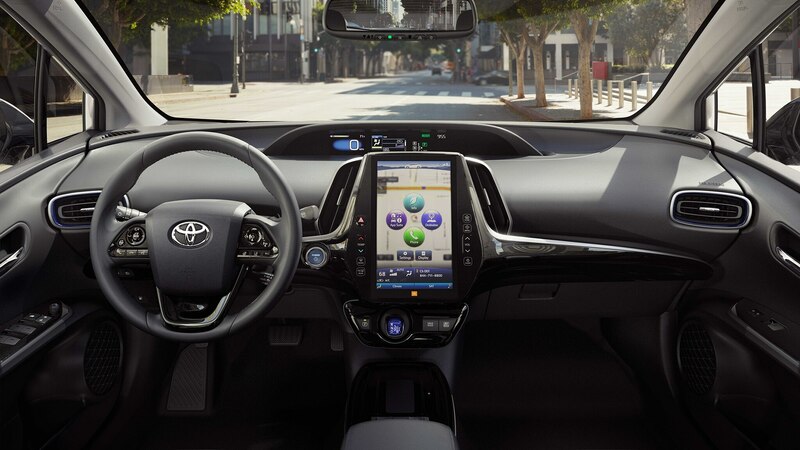 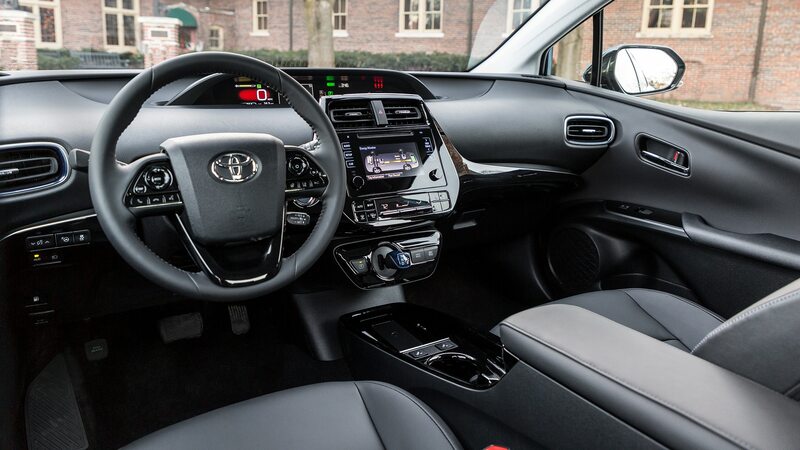 Toyota Safety Sense is standard and packs pedestrian detection, a collision warning and mitigation system, lane-departure assist, automatic high beams, and adaptive cruise control. 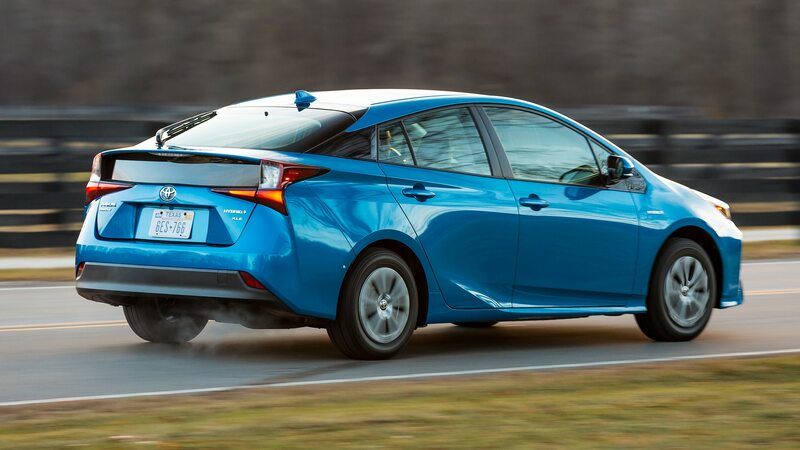 We had hoped, perhaps with too much optimism, that the addition of a rear electric motor might transform the Prius into a fuel-efficient rally beast. 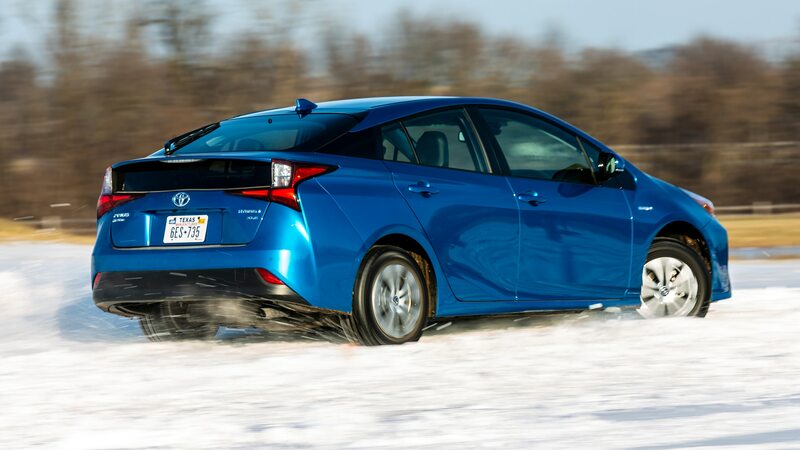 But a day of driving refocused our lens and allowed us to appreciate the liftback for what it is: a nicely engineered and well-packaged—and, yeah, not particularly exciting to drive—solution to tackling winter weather without splurging at the pump.